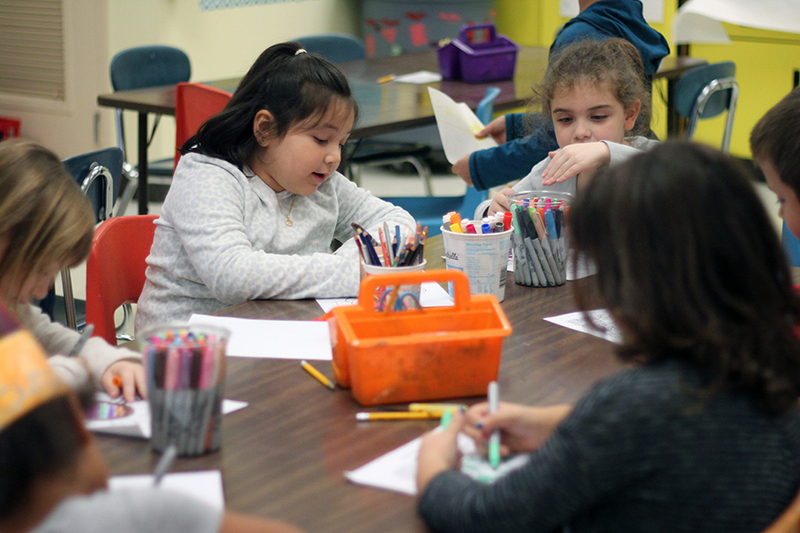 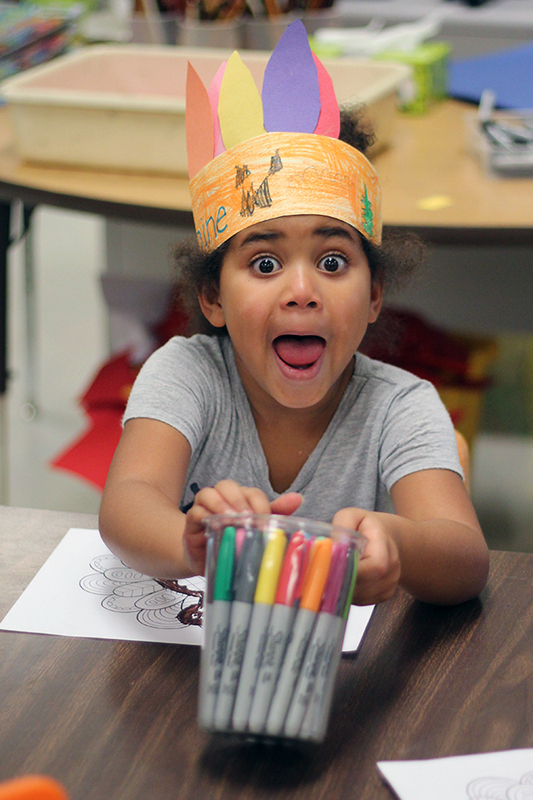 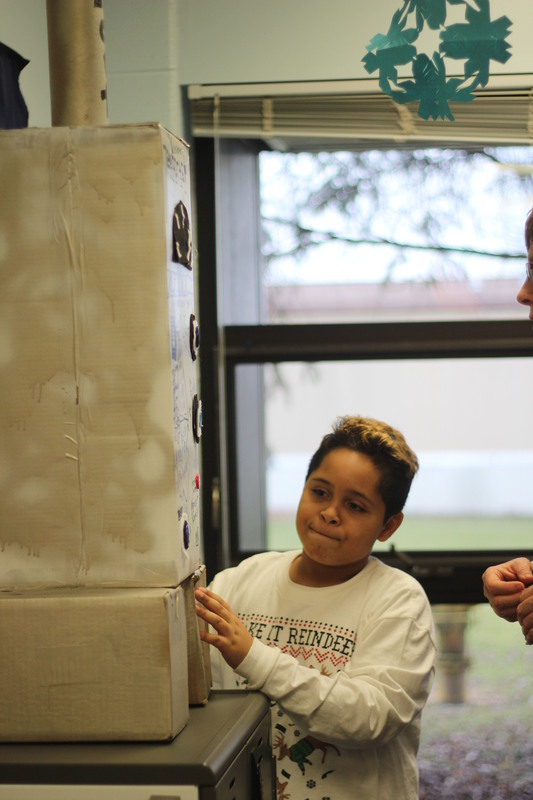 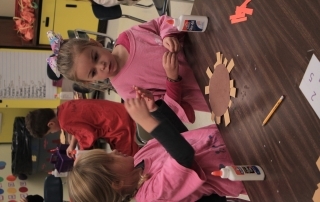 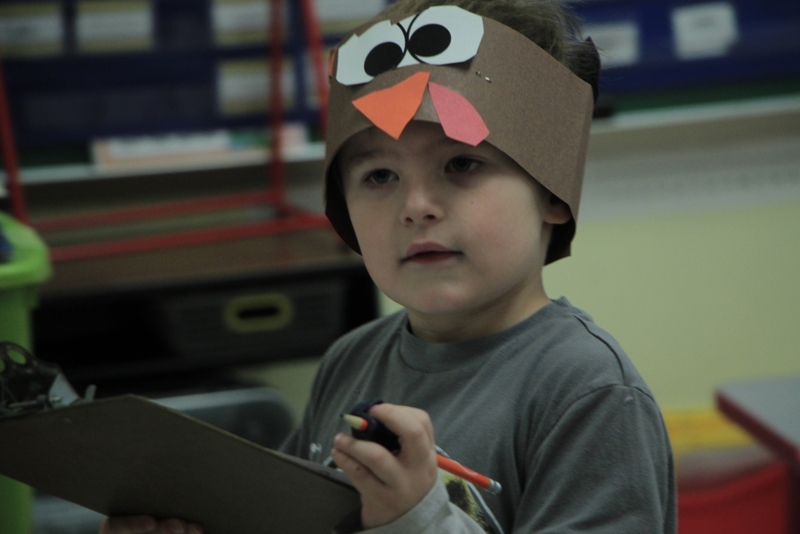 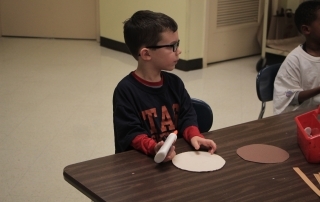 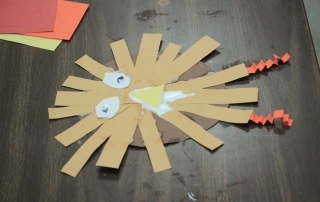 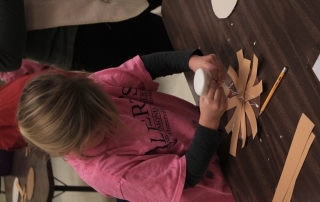 For Thanksgiving, students participated in an activity in art class to make their own turkey. 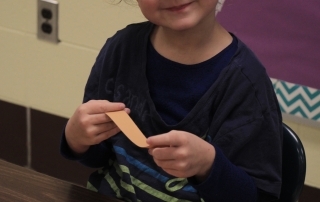 They showed use of their skills in cutting, folding and gluing. 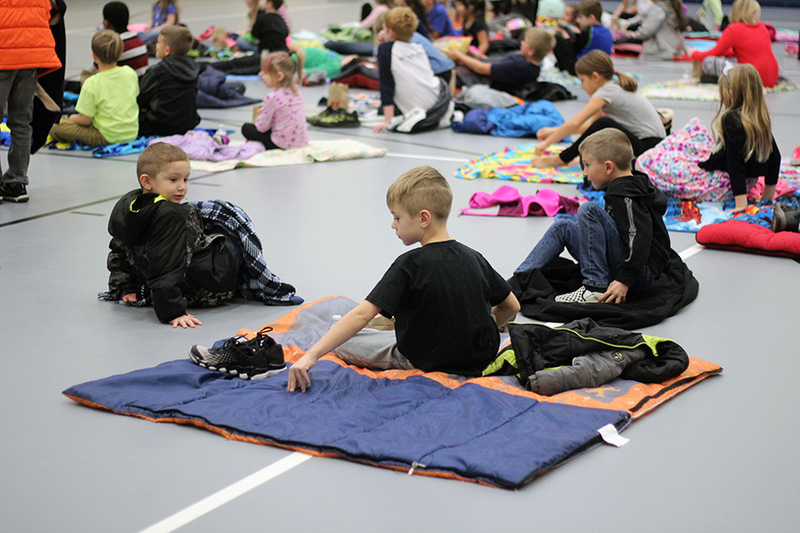 School is cancelled for today Monday Nov. 26, enjoy your day off. 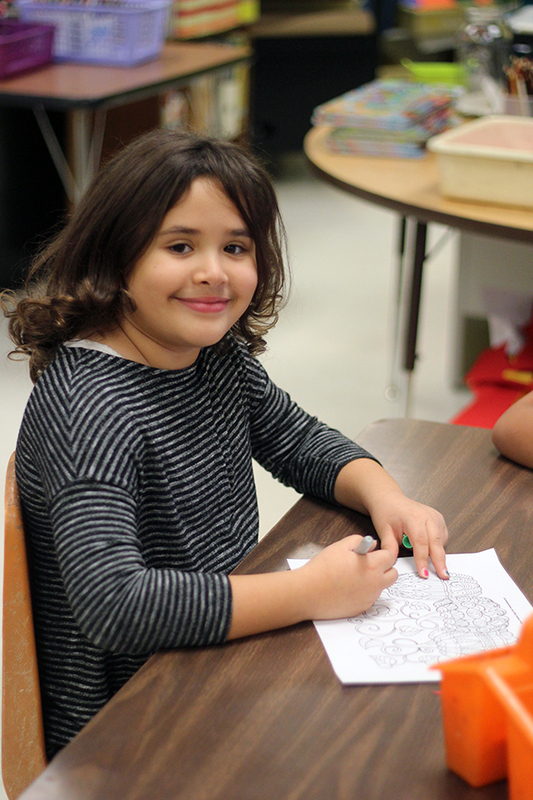 School resumes tomorrow Nov. 27. 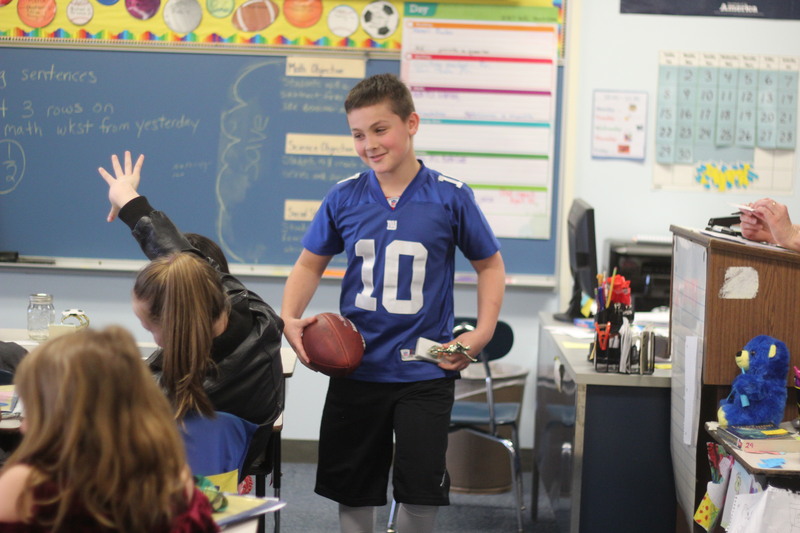 Bibich’s Spell Bowl Team succeeded at their competition at Kahler Middle School on Nov. 16. 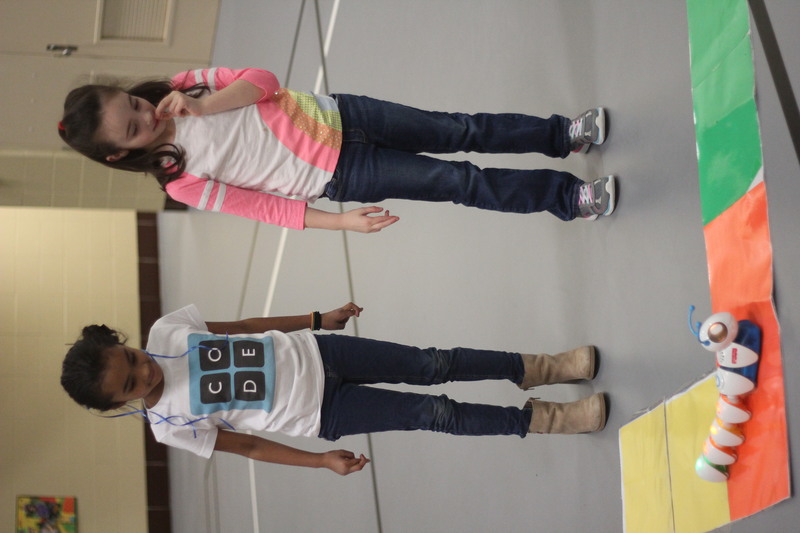 They placed first in their division and third in Indiana. 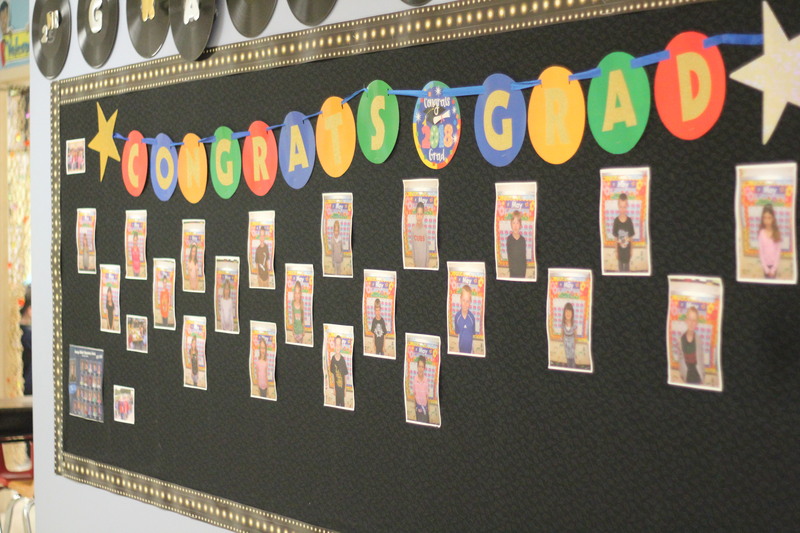 Bibich congratulates them on their achievment. 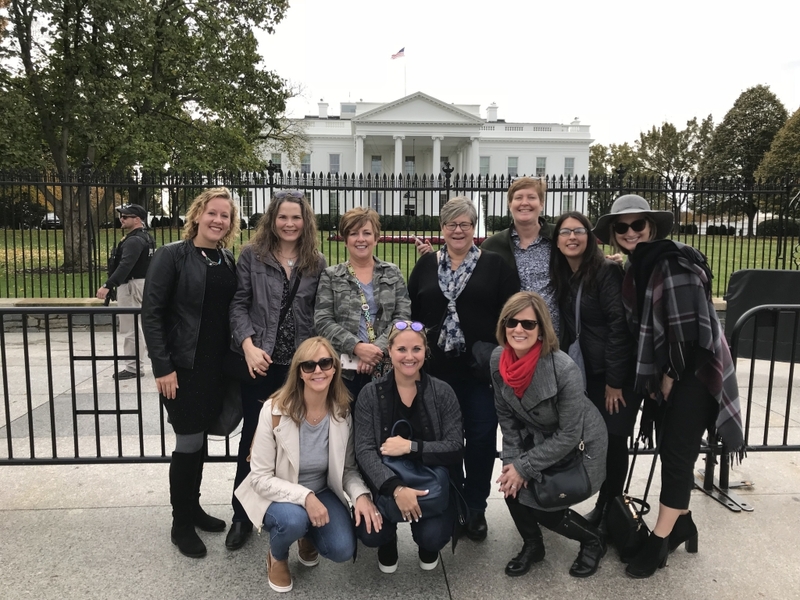 Mrs. Deedee Logan and nine staff members traveled to Washington D.C. to celebrate their success of being nominated as a Blue Ribbon School. 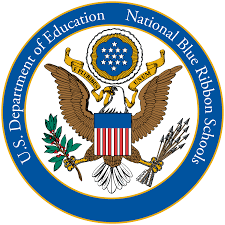 Mrs. Teresa Schoon, Director of Secondary Education, Mrs. Mackowiak, and Mrs. Deedee Logan, Principal, accepted the award from Aba Kumi, Director of National Blue Ribbon Schools Program, at the ceremony. 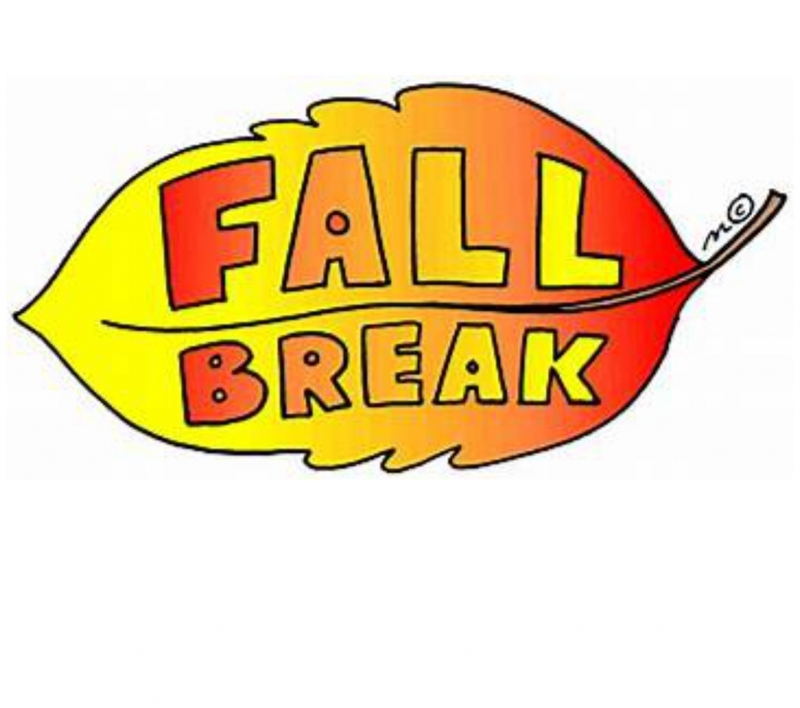 Have a happy and safe Fall Break. 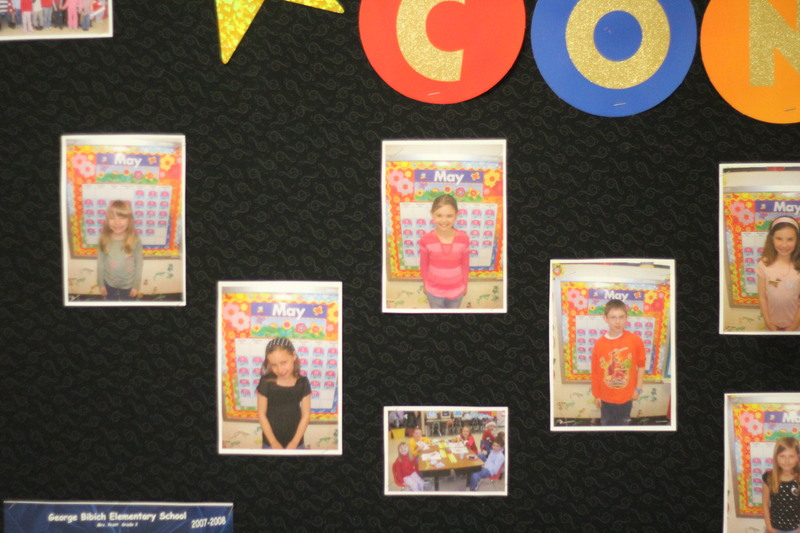 School will resume on Mon. 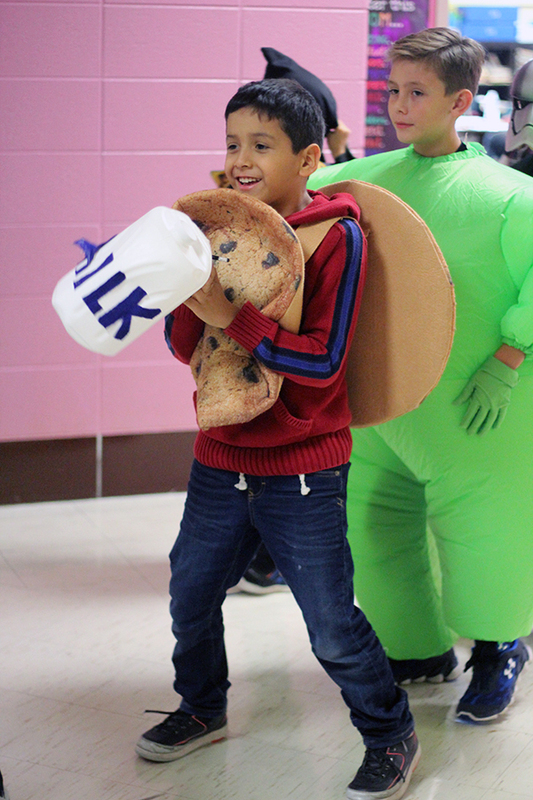 October 29. 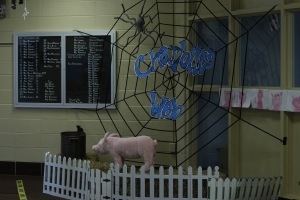 Bibich decorated the hallway in front of the office in honor of Charlotte’s Web. 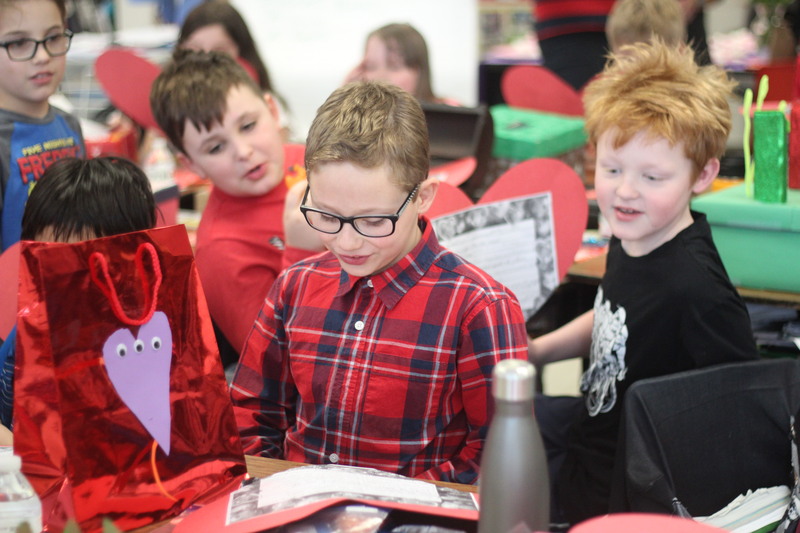 The reveal went with the reveal of the novel. 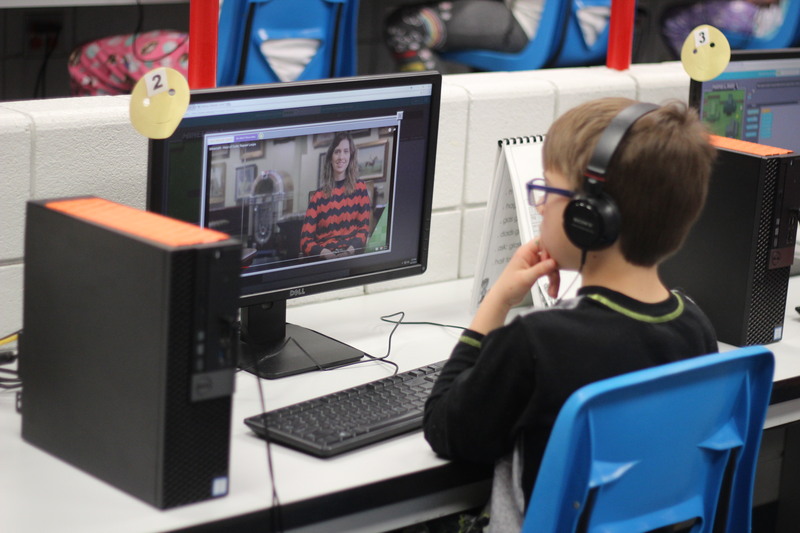 Students in computer class interact with the computers. 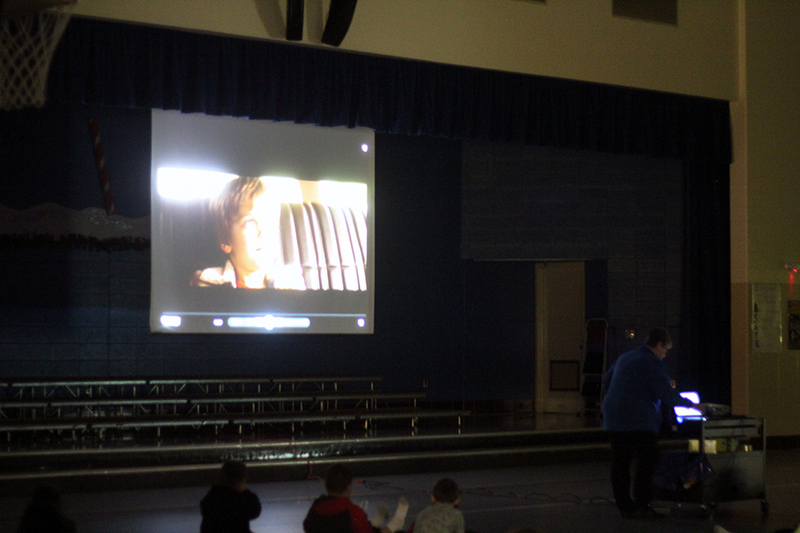 The students did an interactive video where they went with the lesson. 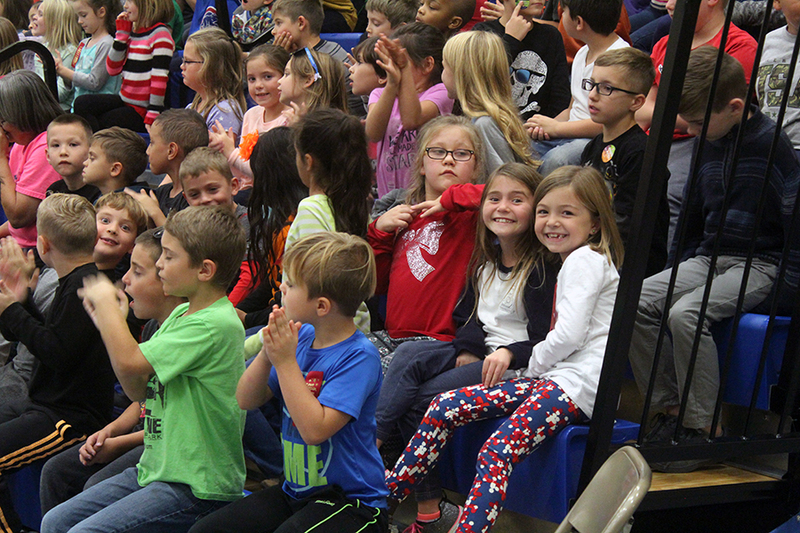 Congrats to Bibich as they were honored with the National Blue Ribbon School Award! 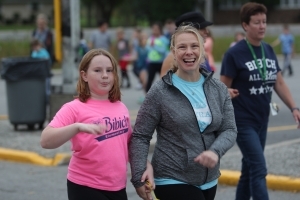 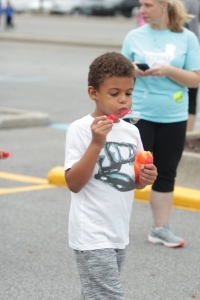 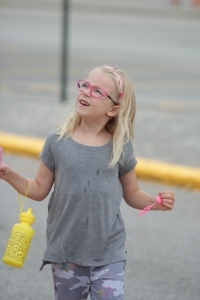 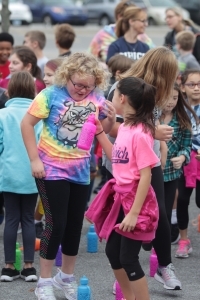 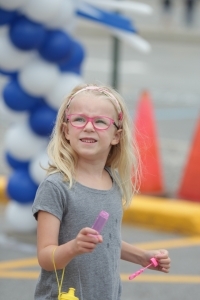 On Wednesday October 10, Bibich held their annual Walk-a-thon event. 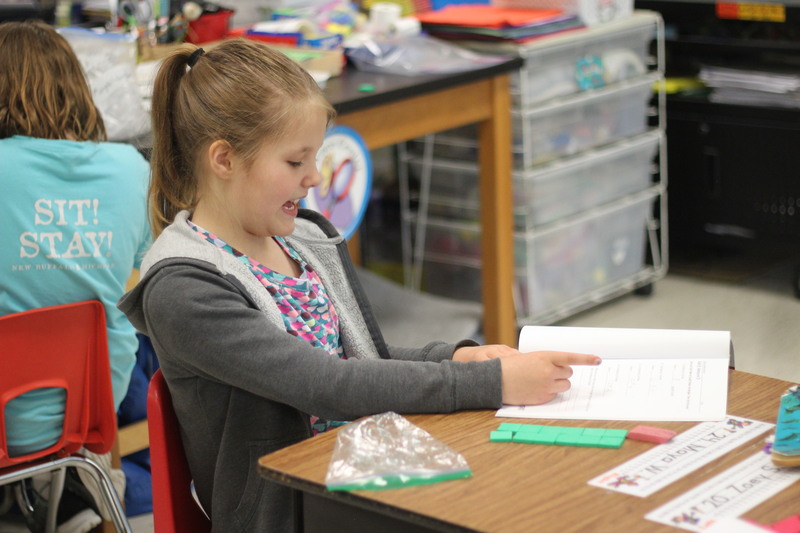 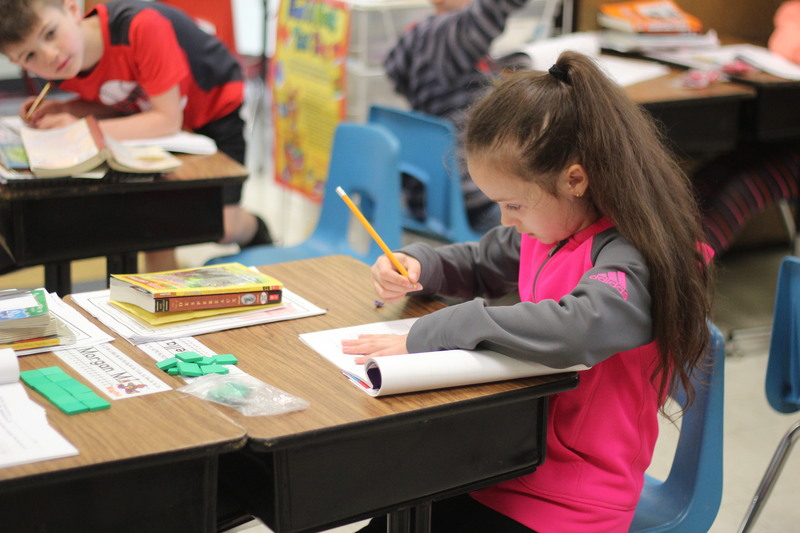 On May 16, Mrs. Torrez’s second grade class works on multplication worksheets. 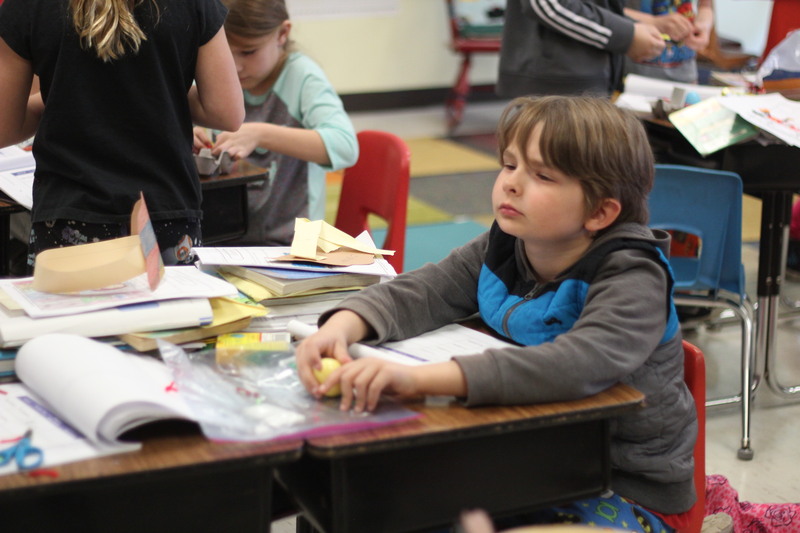 The students have been working on multiplication for some time and want to perfect their skills before they move onto third grade. 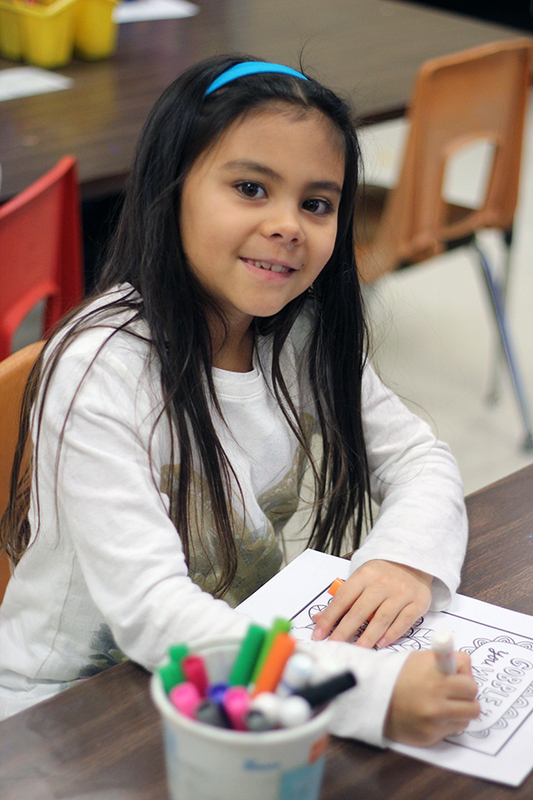 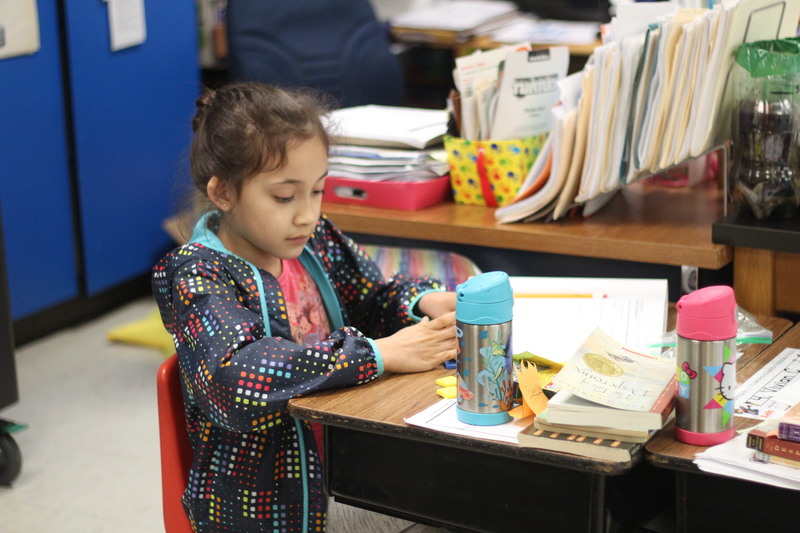 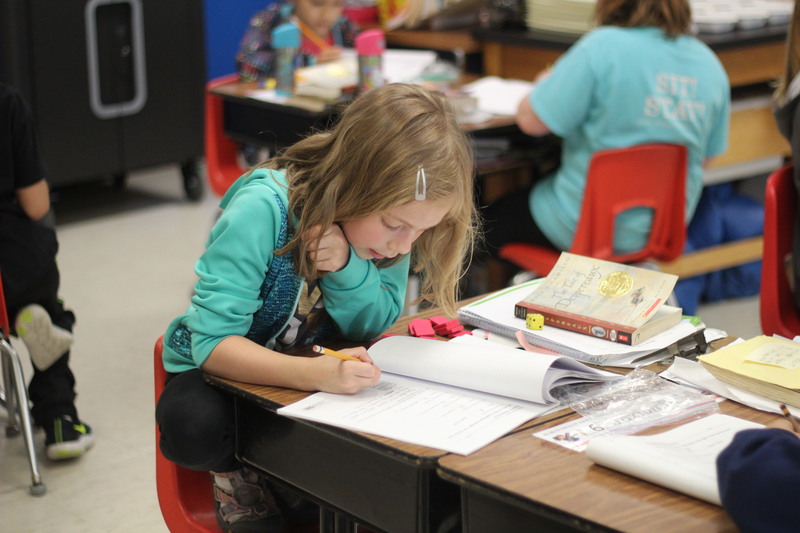 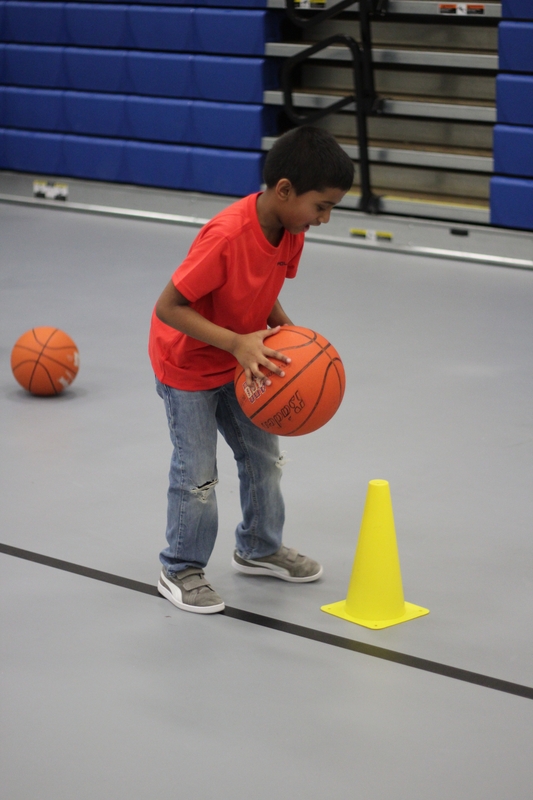 As the school year winds down, students try to get their school work done quickly so they can enjoy their end of the year activities coming up like field day. 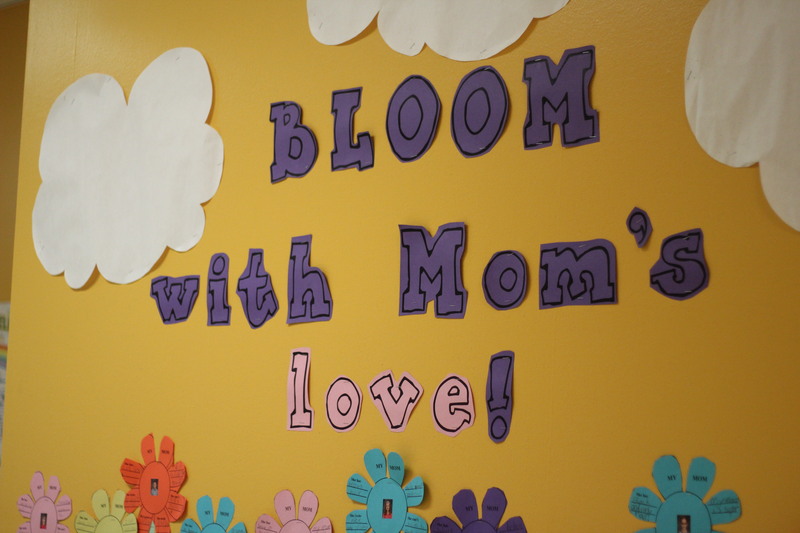 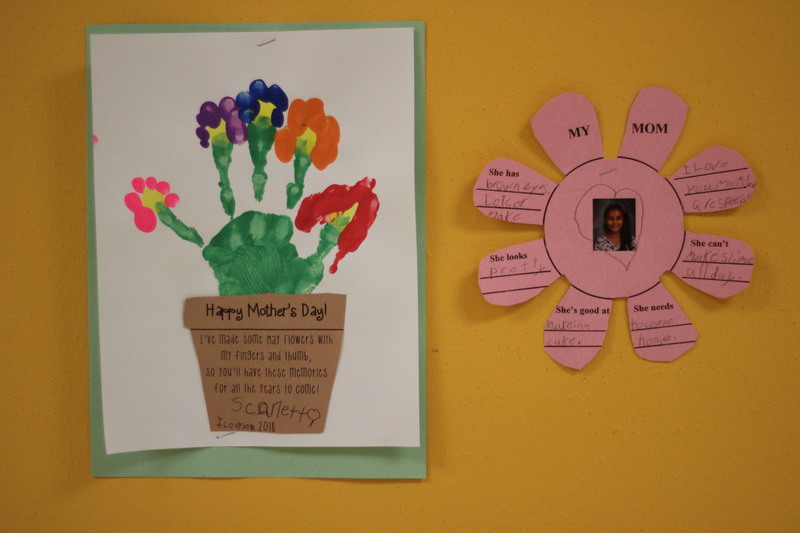 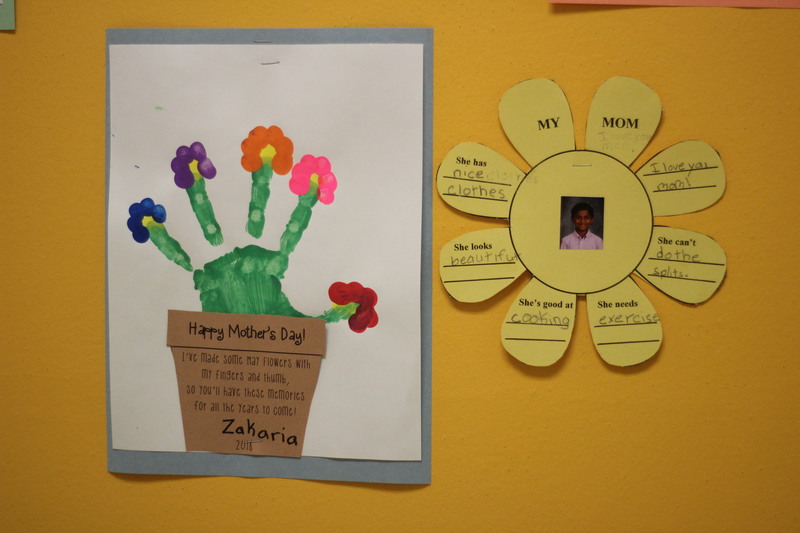 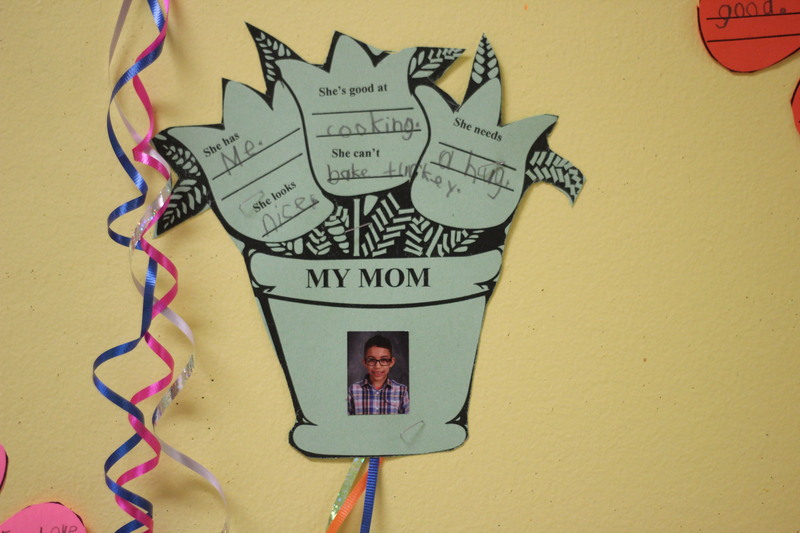 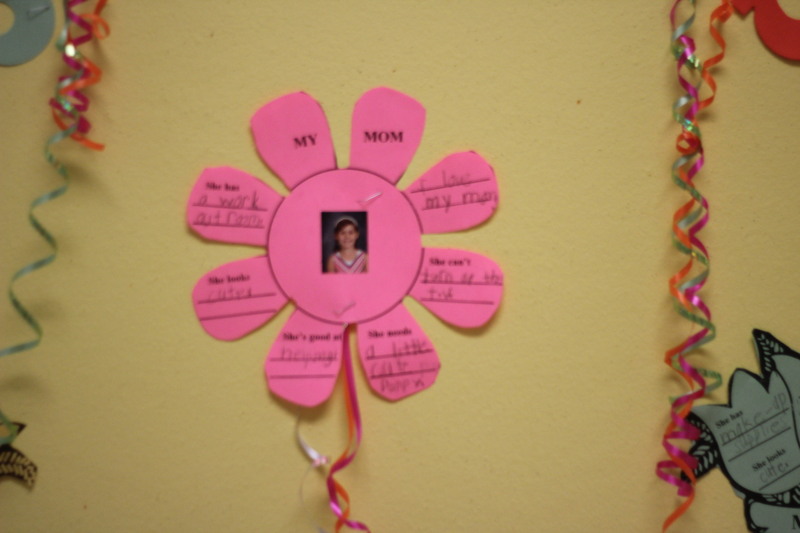 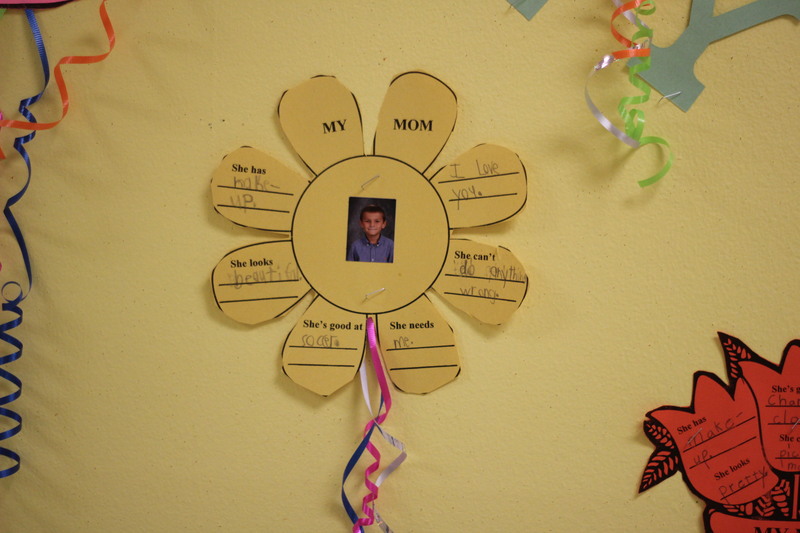 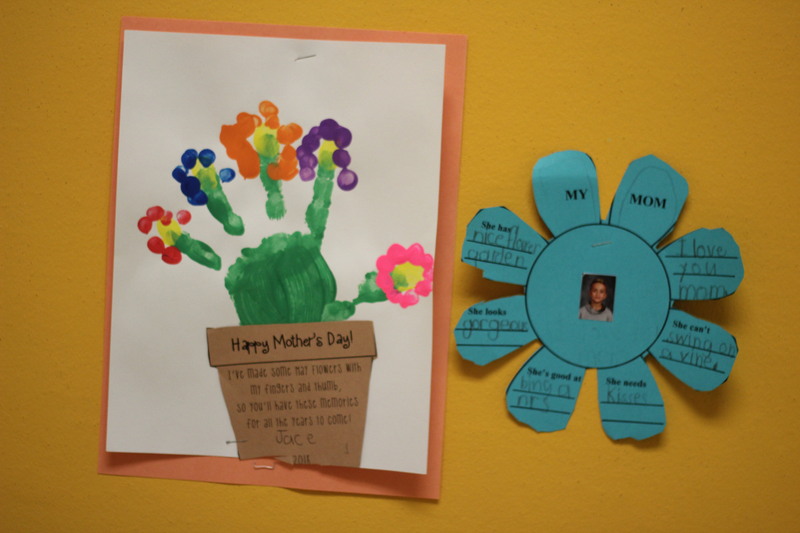 To celebrate Mother’s day on May 12, students made artwork for their Mothers for when they come here to watch students perform their Mother’s Day programs. 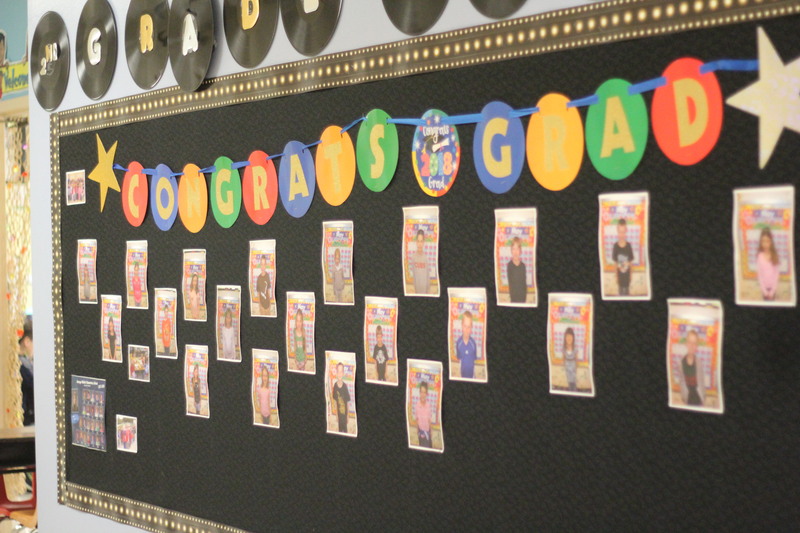 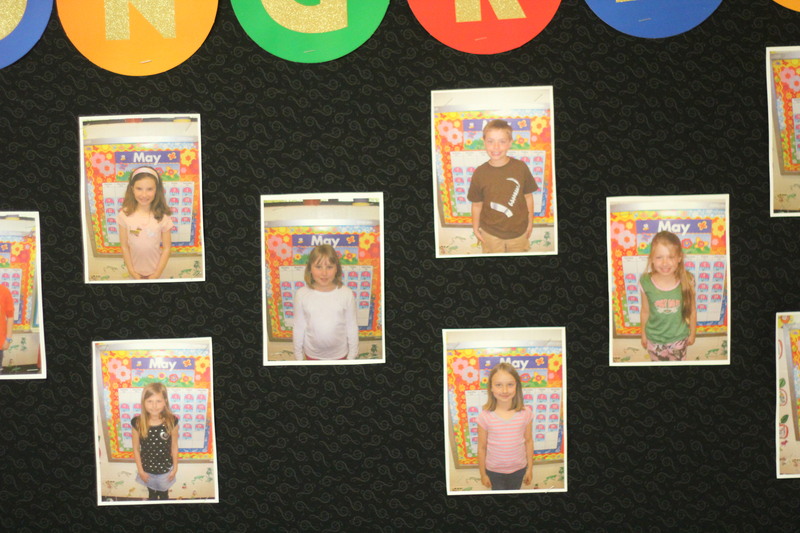 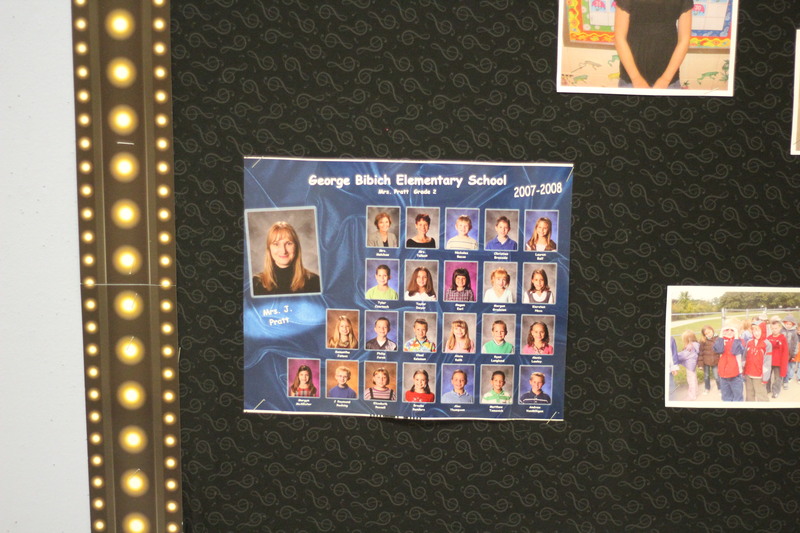 Before the class of 2018 students who went to Bibich for elementary school came back for their walk through, teachers decorated their walls with class pictures of the students when they them in class many years ago. 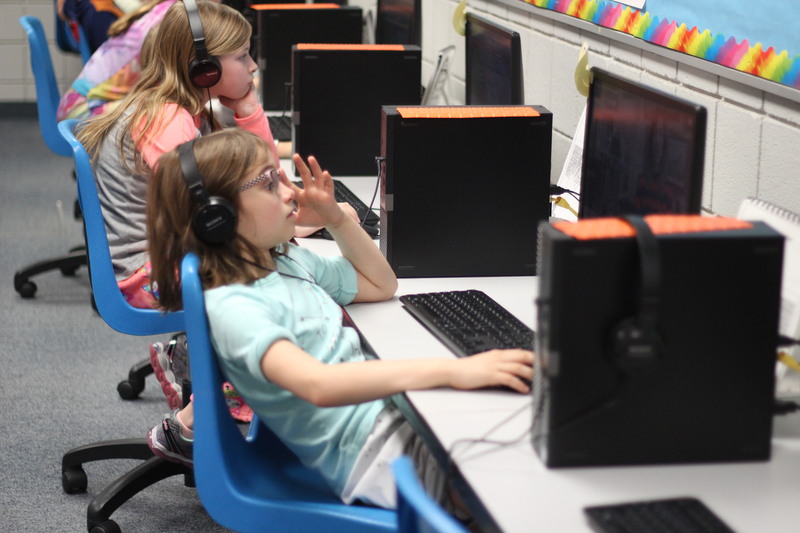 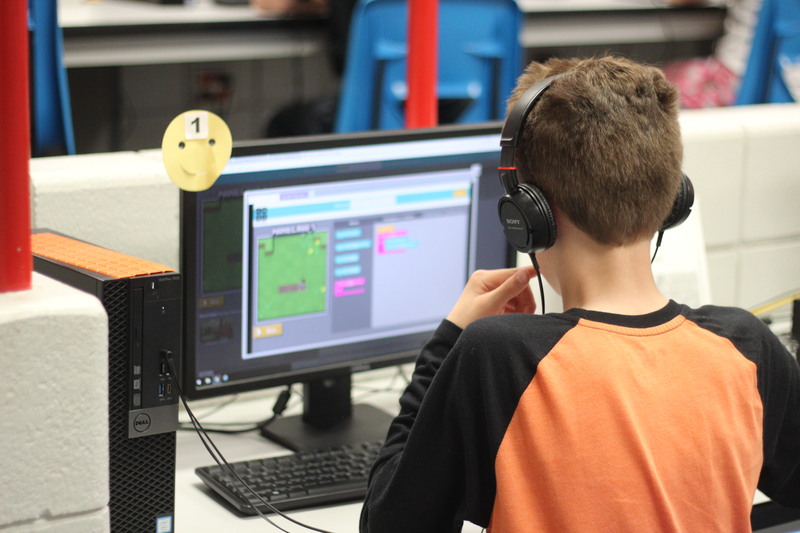 In Mrs. Perez’s computer class on Friday, April 27, students learned how to code. 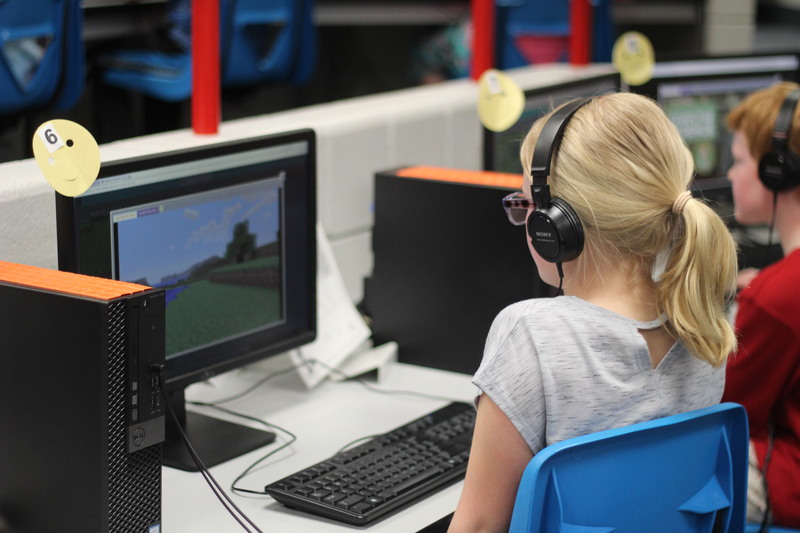 Student were able to watch videos and tutors online and learn how to code using Minecraft as an example. 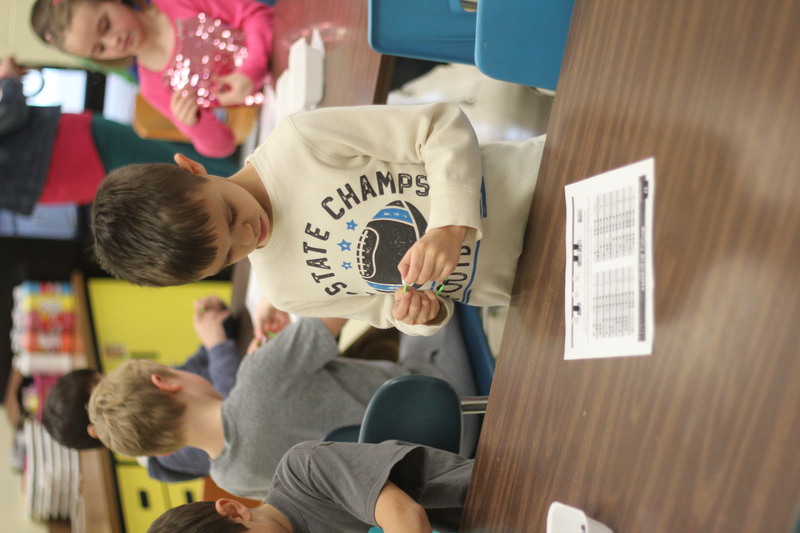 In Mrs. Torres’ class, students learned how to make seat belts for eggs. 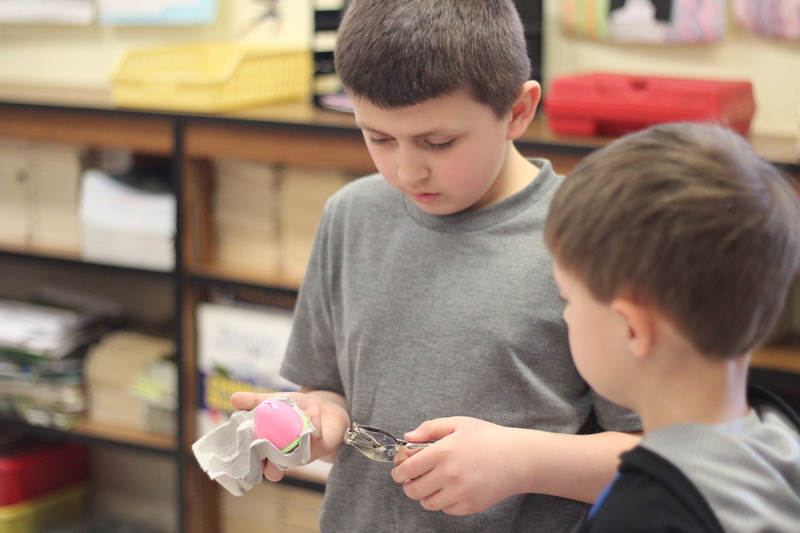 Students learned how to cut and measure string to the right length and made sure the seatbelts were secure on the eggs without breaking them. 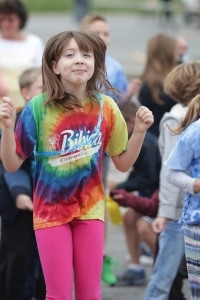 From April 29 to May 2, Bibich will be participating in the Riley Hospital Bucket Fundraiser. 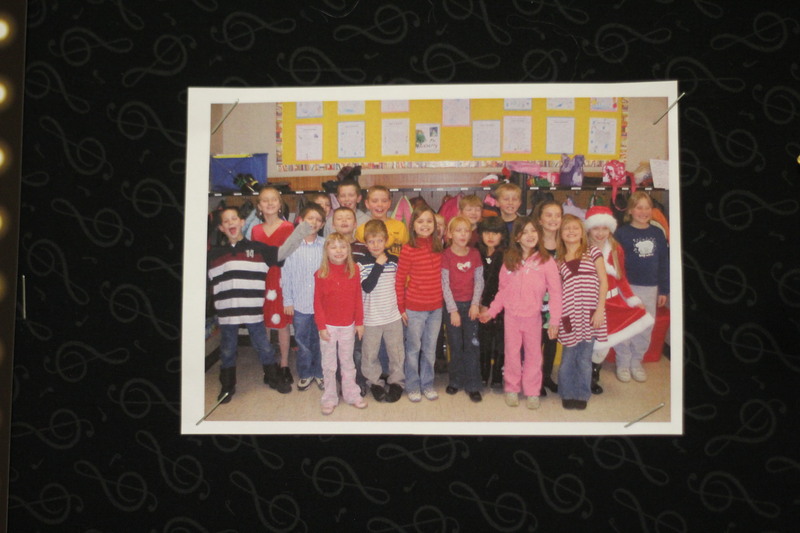 Everybody is asked to make a small donation, in which all the proceeds will go to Riley Hospitals. 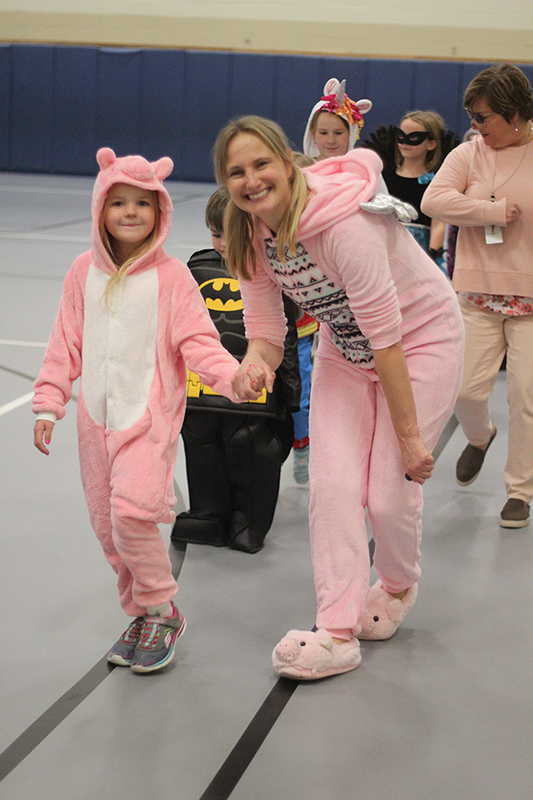 During the week, the students can participate in dress up days including sock and hat day. 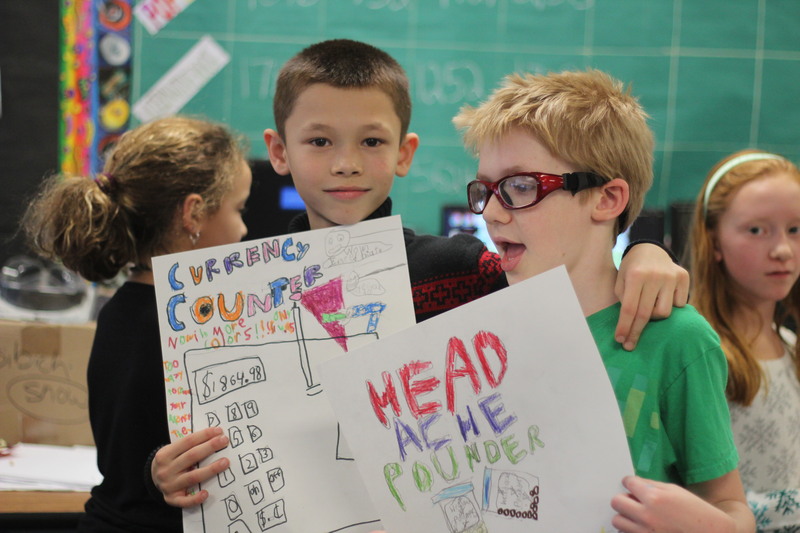 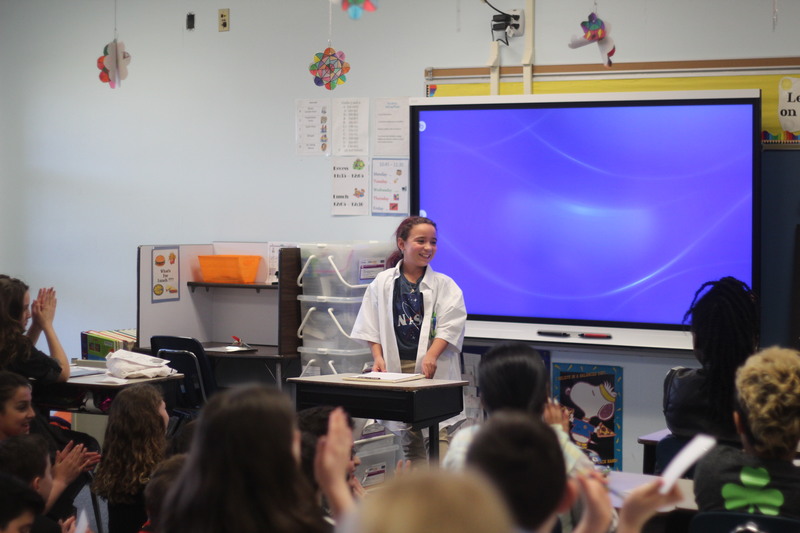 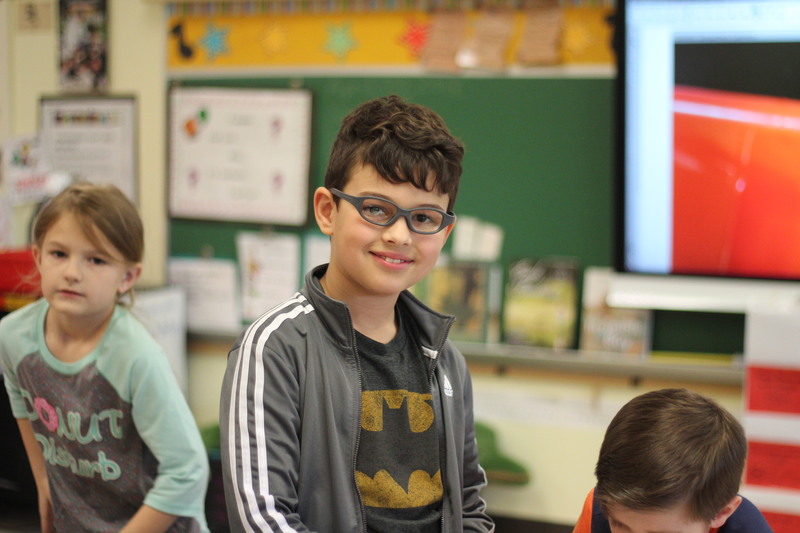 On April 10, fourth grade students had their famous Hoosier presentations. 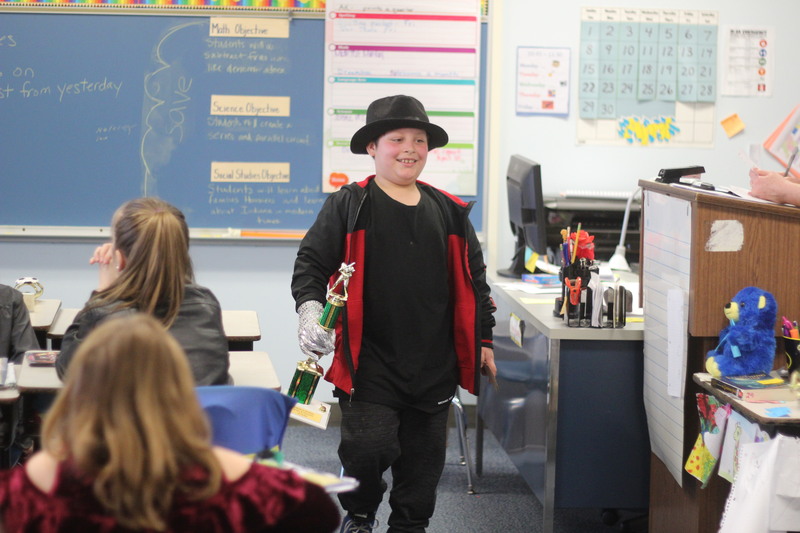 Students were able to pick one famous Hoosier to look into, write a paper about and present. 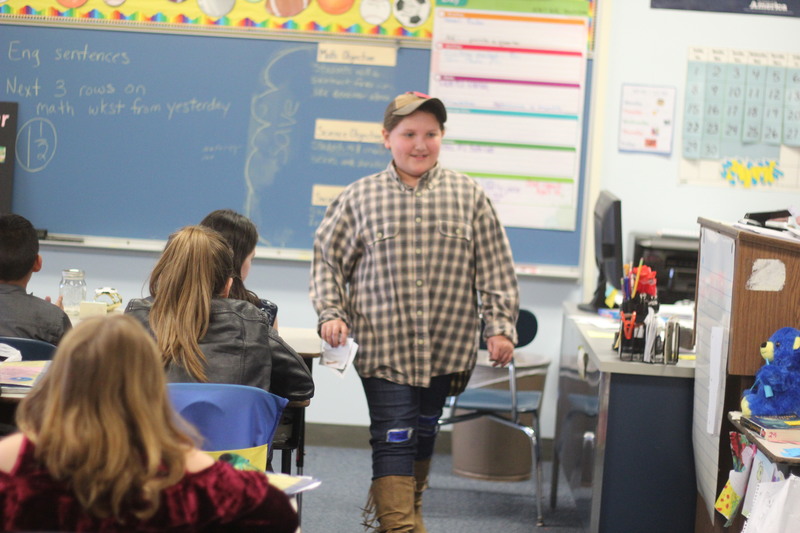 Students were encouraged to dress as their famous Hoosier and bring in props that connected with the Hoosier. 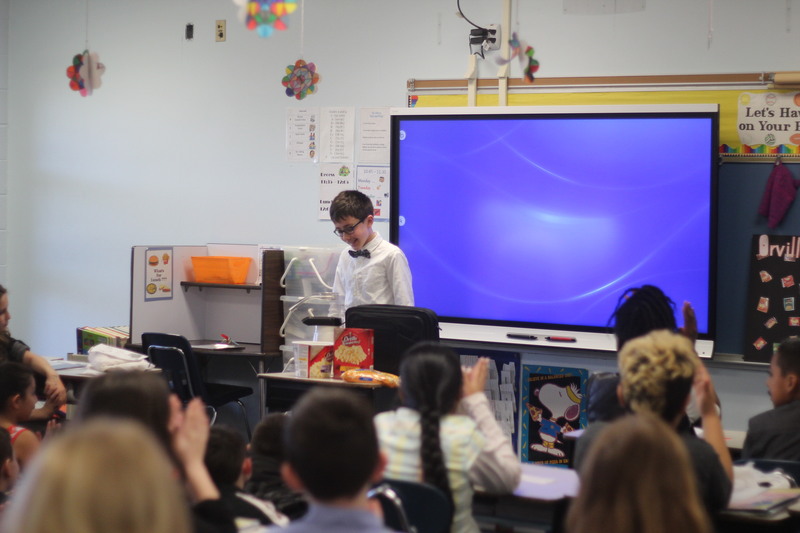 Famous people were Michael Jackson, Janet Jackson, Peyton Manning and Orville Redenbacher. 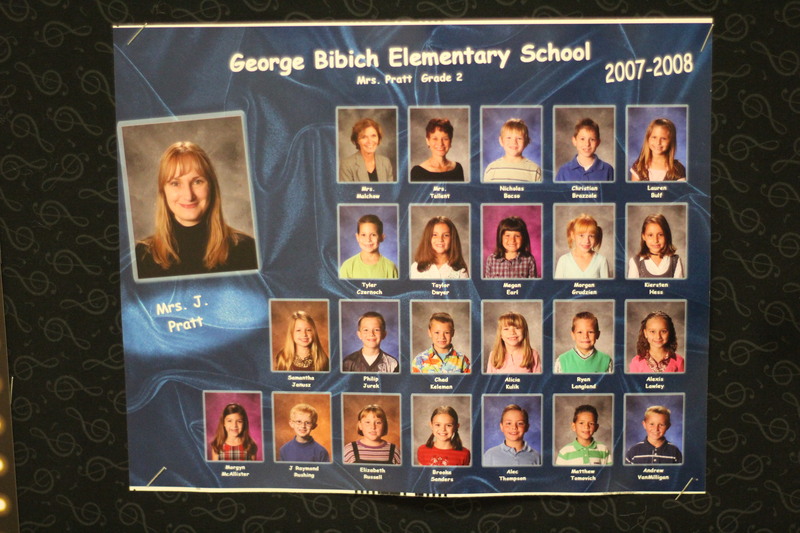 On March 20, Bibich held a lockdown drill at the school. 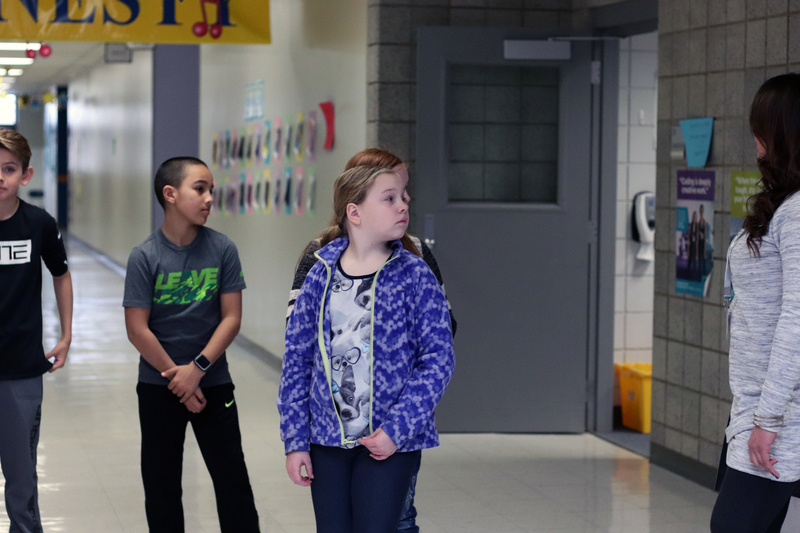 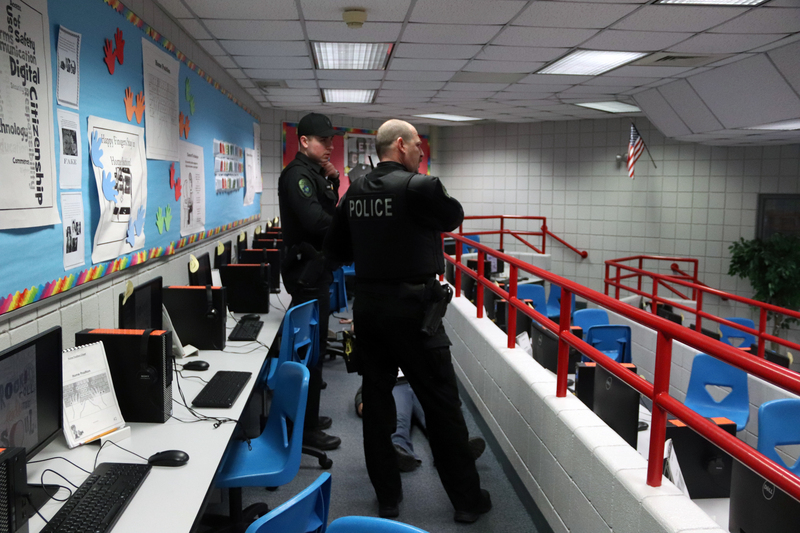 Students, staff and local police departments participated in the drill. 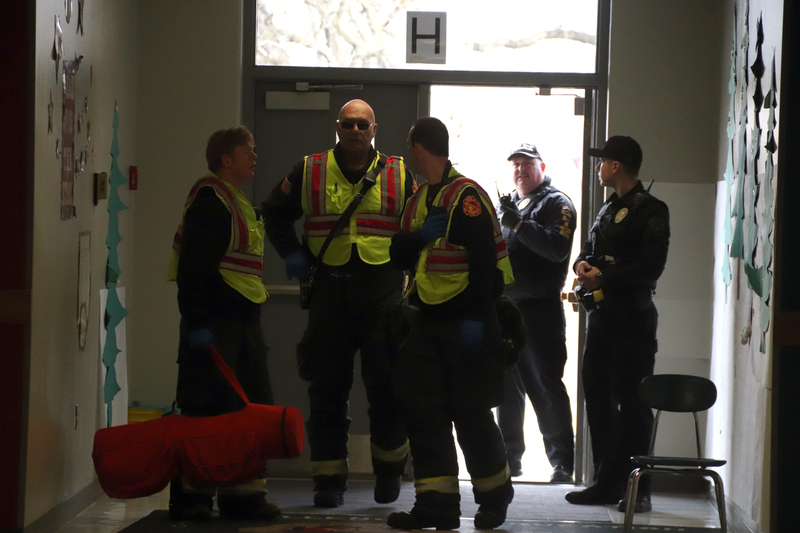 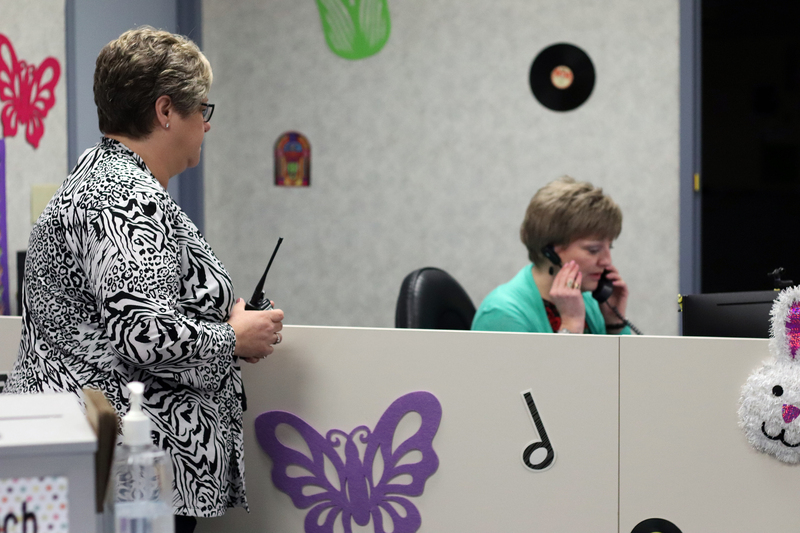 The scenarios of students and staff getting injured and a shooter on the premises were practiced to ensure that the students and faculty knew what to do in those situation. 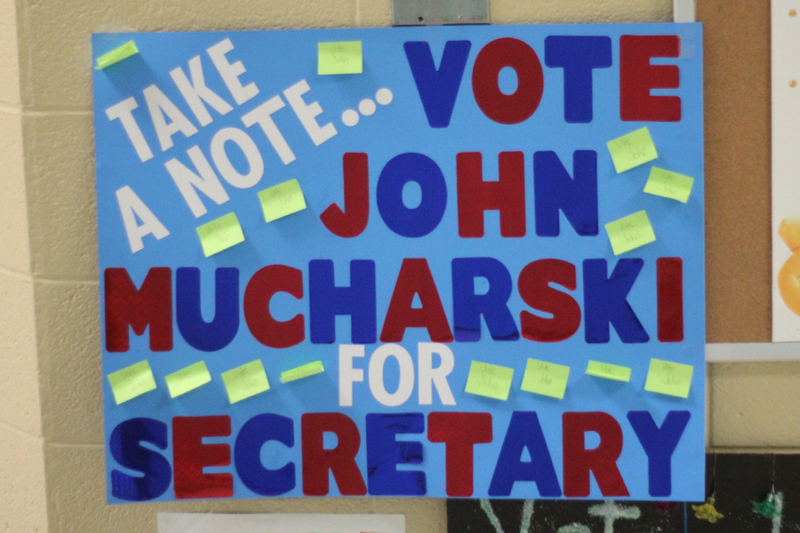 Thank you to everyone who participated and made everything run smoothly! 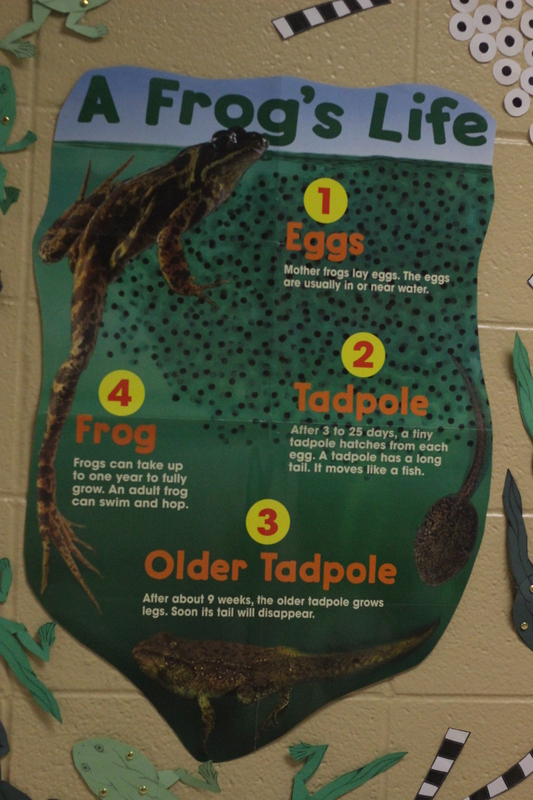 The third grade classes at Bibich learn about the life cycles of animals. 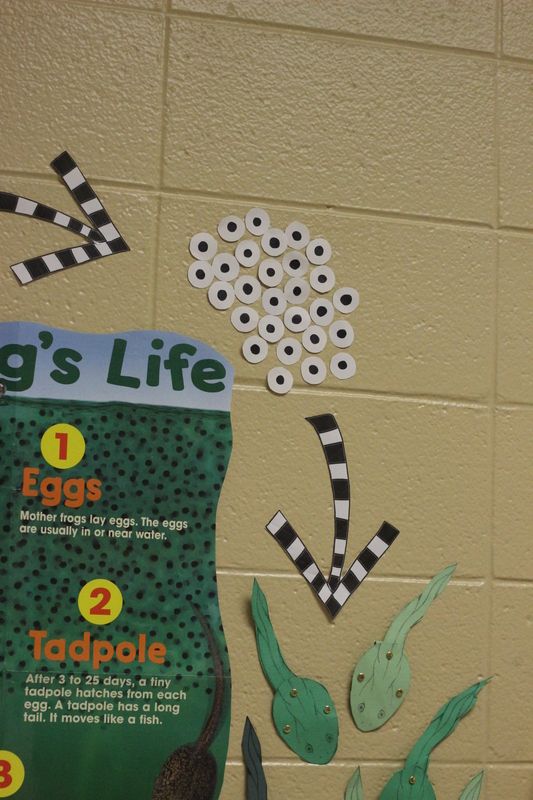 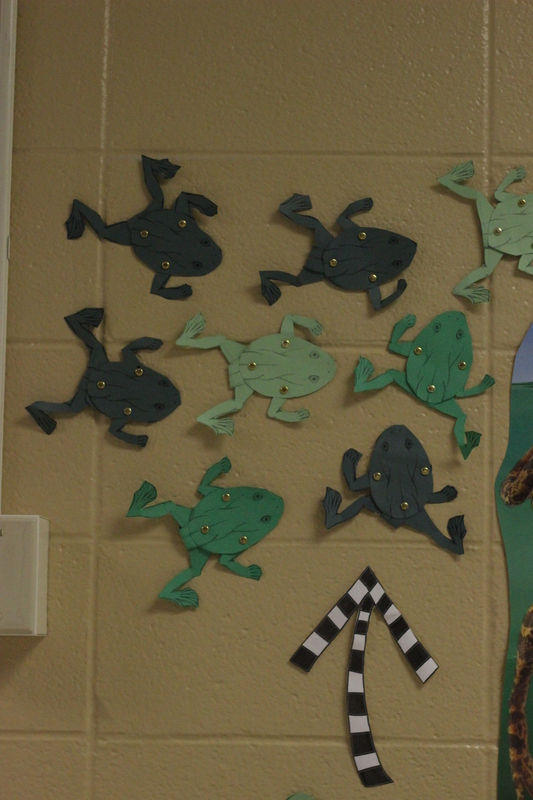 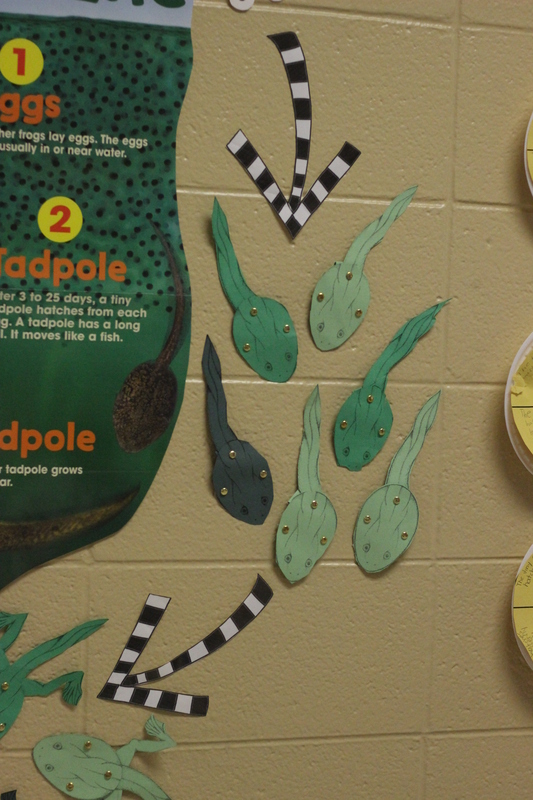 The students make crafts that show the life cycles of baby chicks and tadpoles. 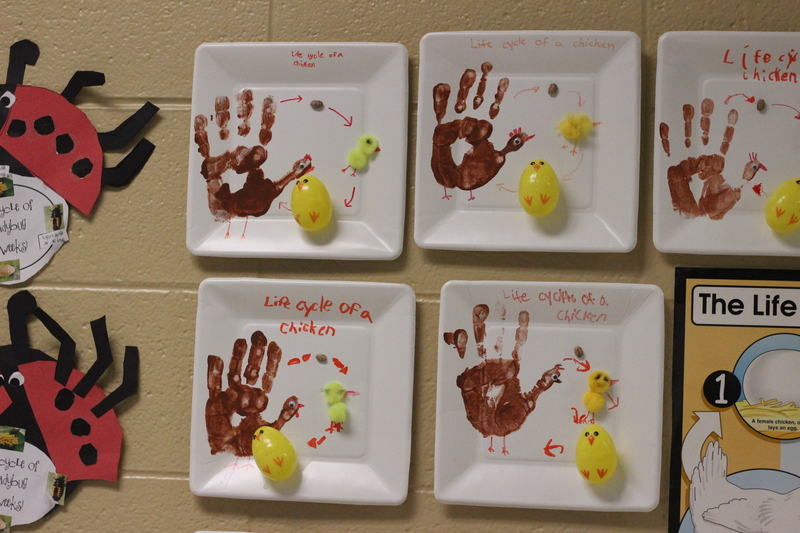 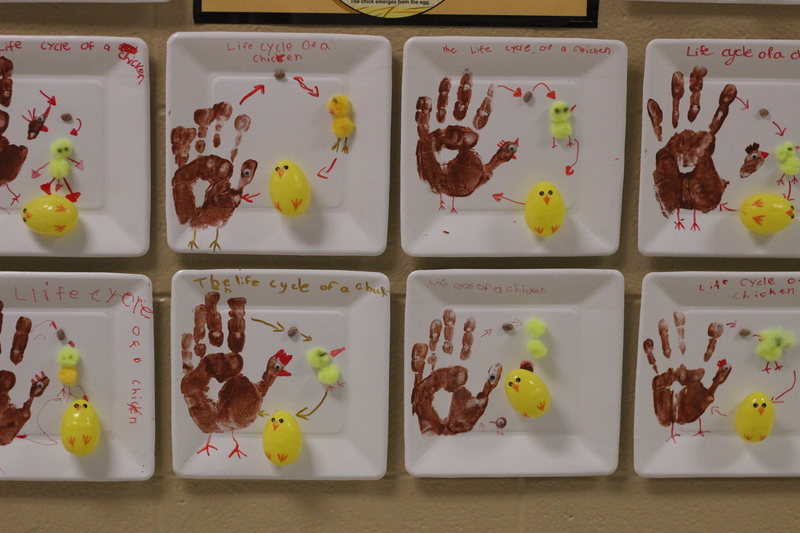 Students used their handprints, plastic eggs, and fuzz balls to demonstrate the stages of life the chicks were in. 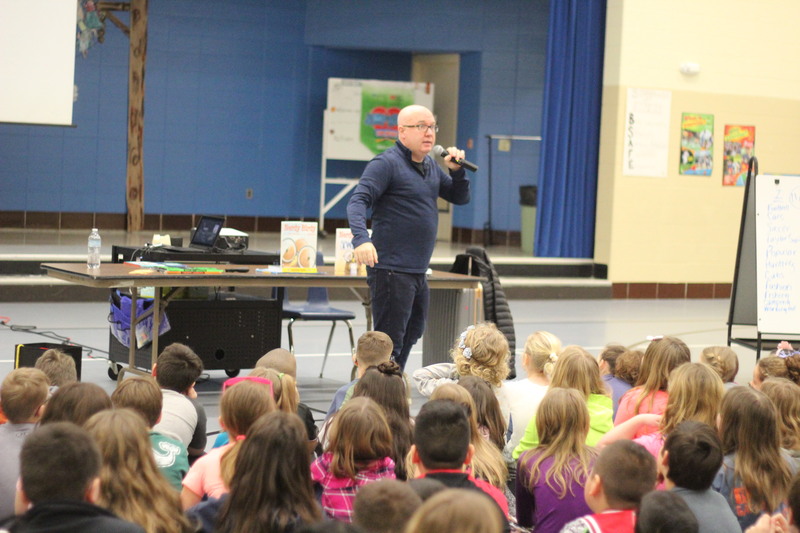 On Feb. 22, Aaron Reynolds, author of Nerdy Birdy, visited Bibich Elementary. 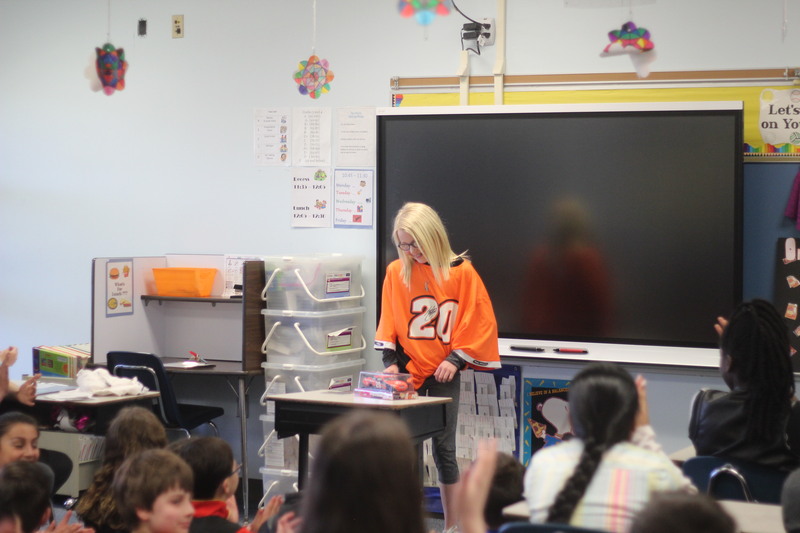 Reynolds played a game with the students to help the students understand his message. 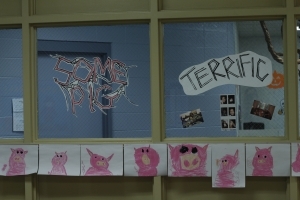 Reynolds wanted to spread his message about bullying about how everyone is unique in their own ways. 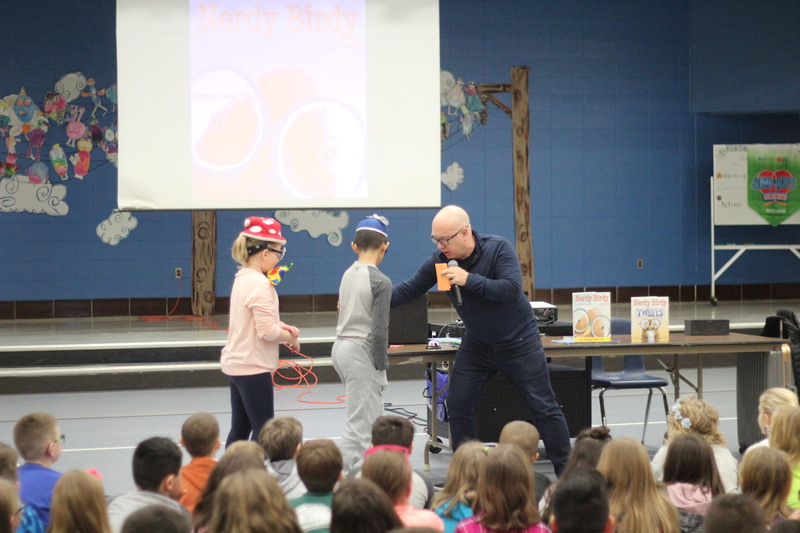 Reynolds then read “Nerdy Birdy”or “Creepy Carrots” to the students. 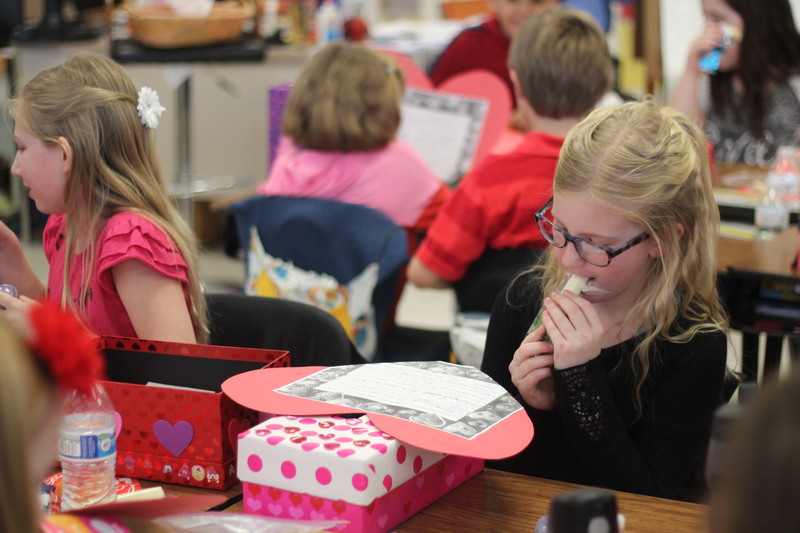 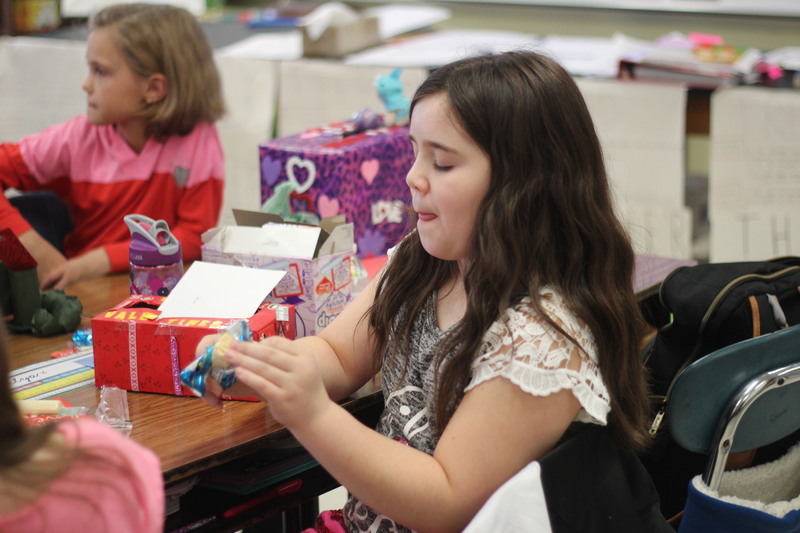 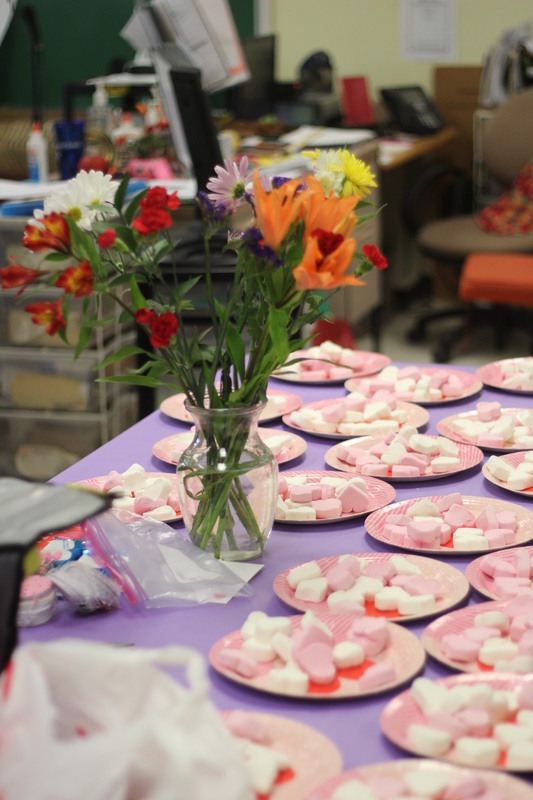 On Wednesday, Feb. 14 BBibich had their annual Valentine Day classroom parties. 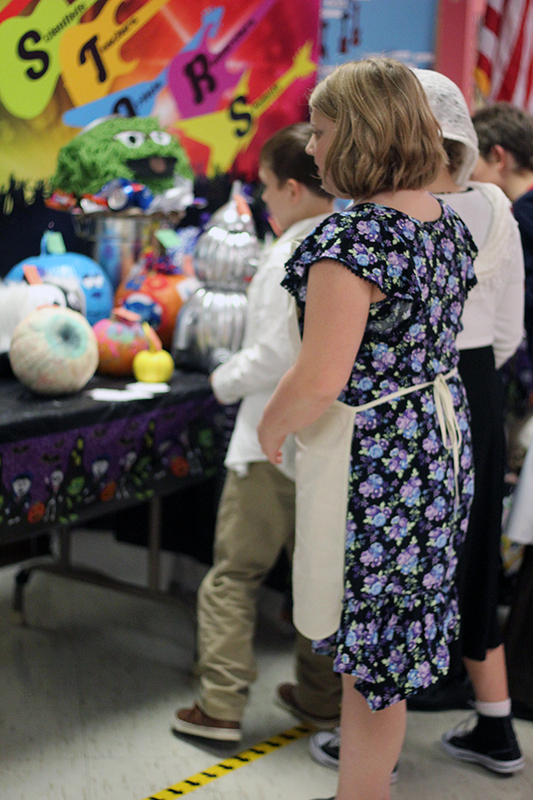 Parents of the students volunteered and helped organize the parties. 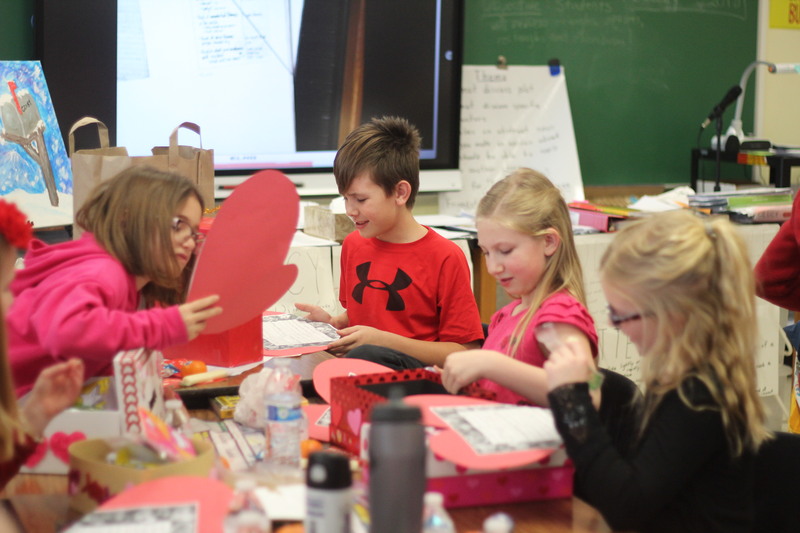 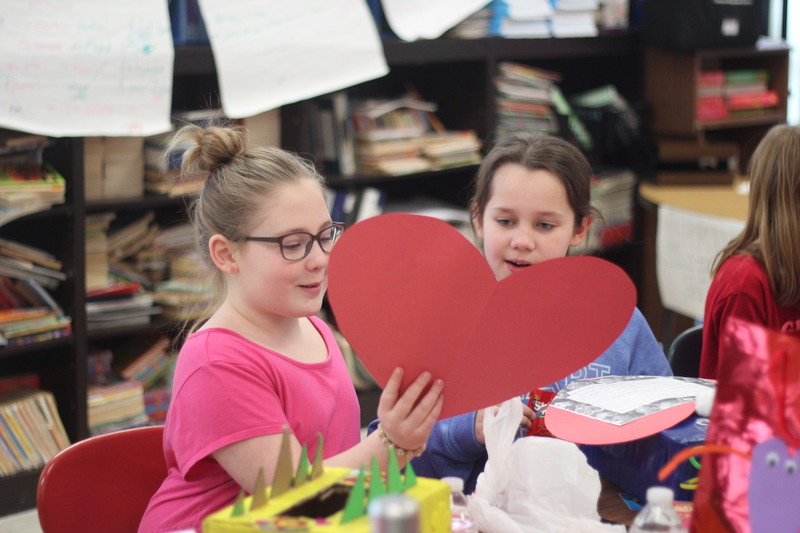 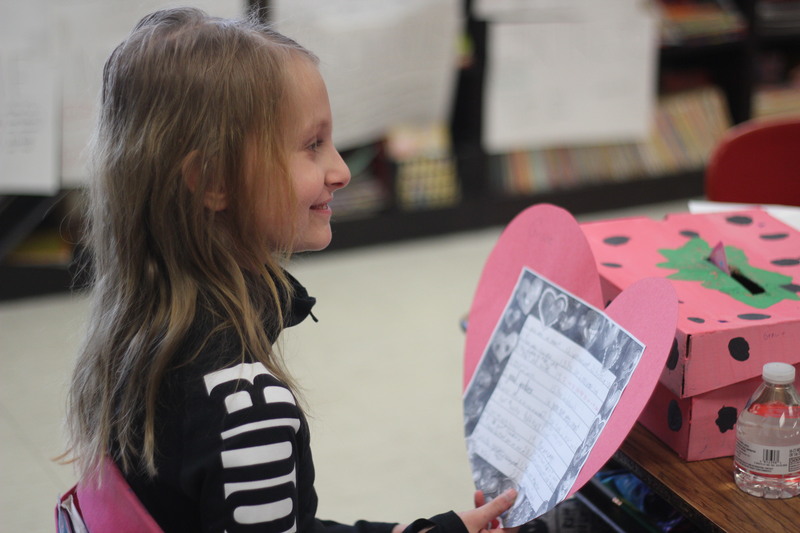 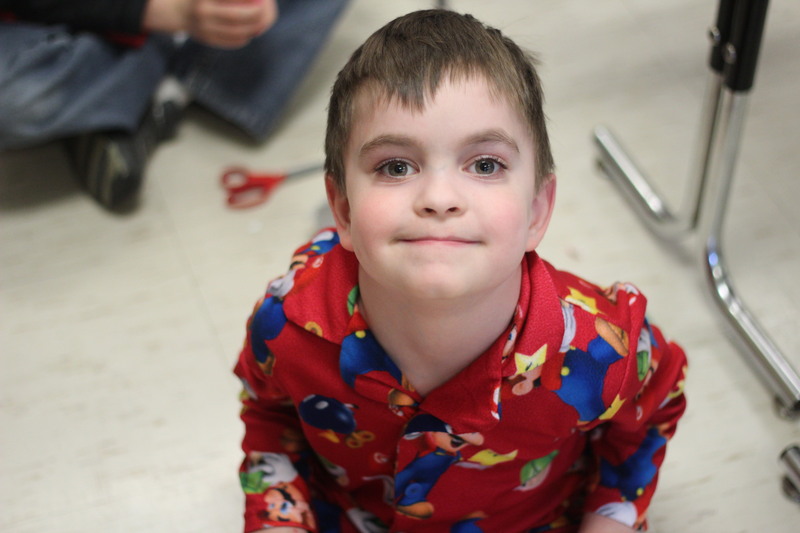 Some parties included different games like bingo, crafts and exchanging valentines with each other. 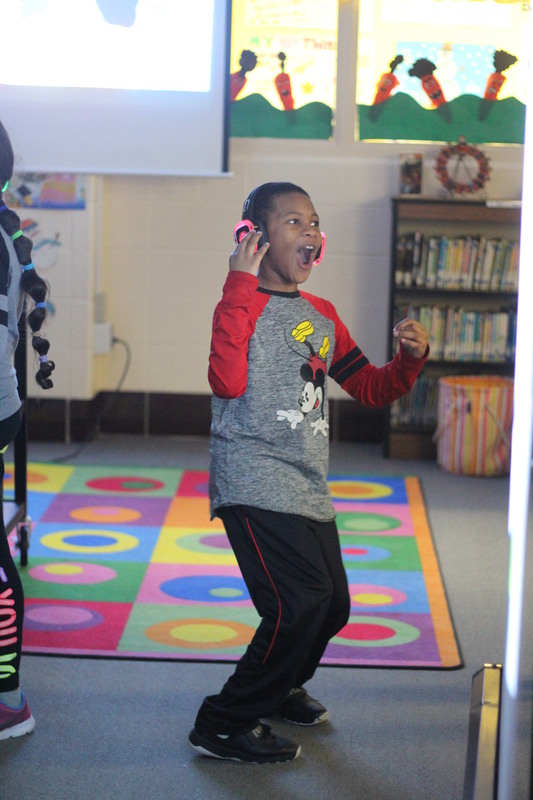 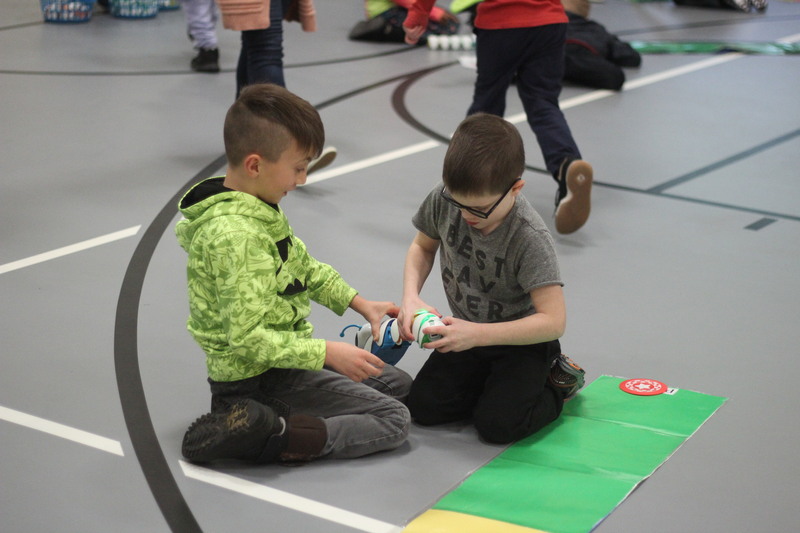 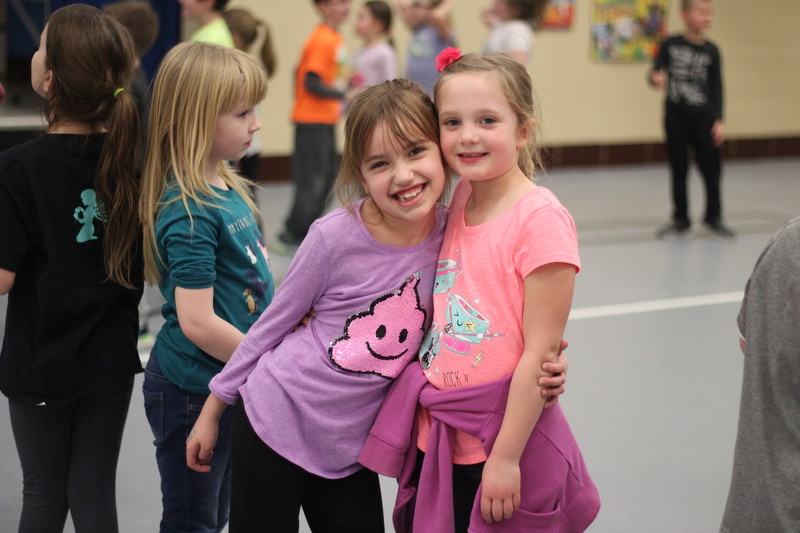 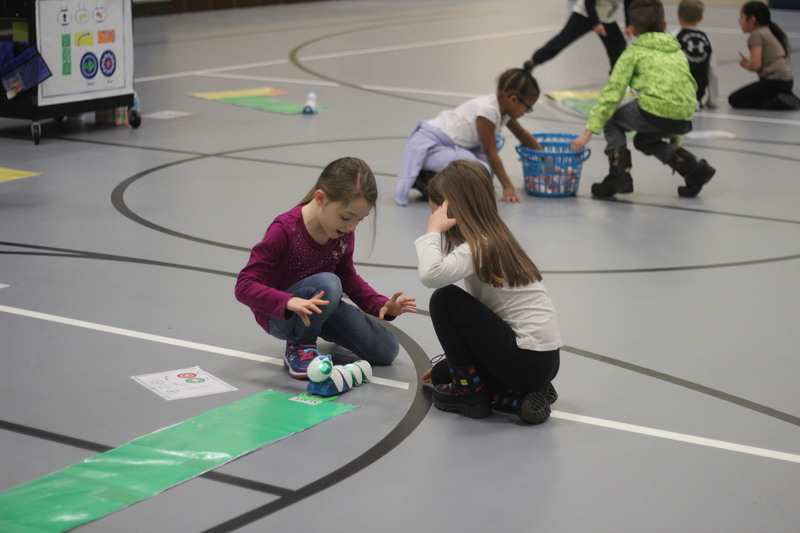 On Feb. 13, Bibich held their annual Jump Rope for Heart. 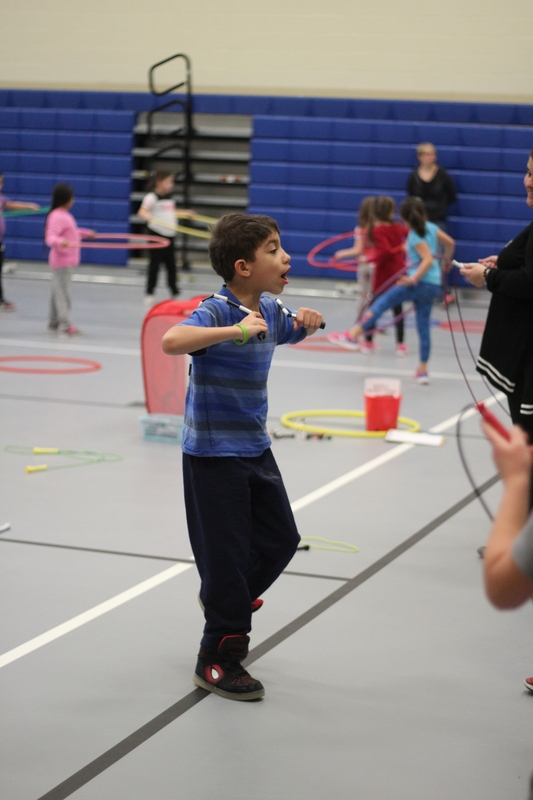 Students in all grades participated throughout the day by jumping rope, playing basketball and playing Just Dance. 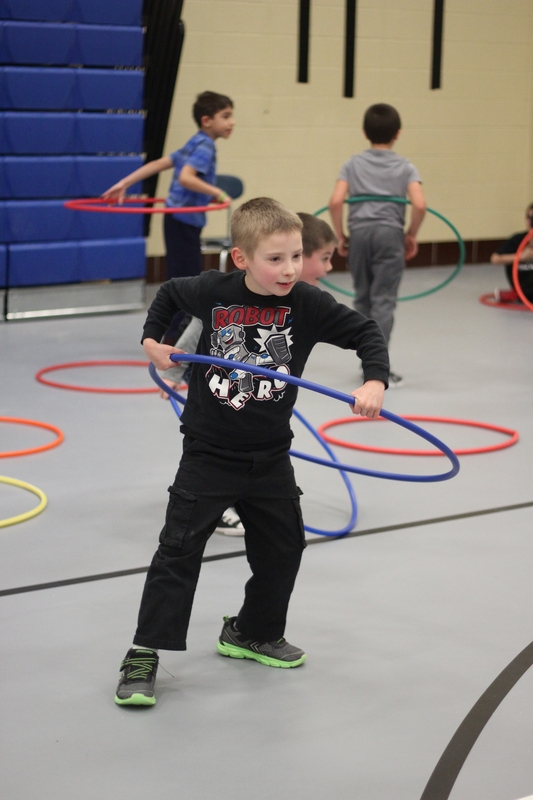 The students raised money leading up to Jump Rope for Heart to raise awareness for the National Heart Association. 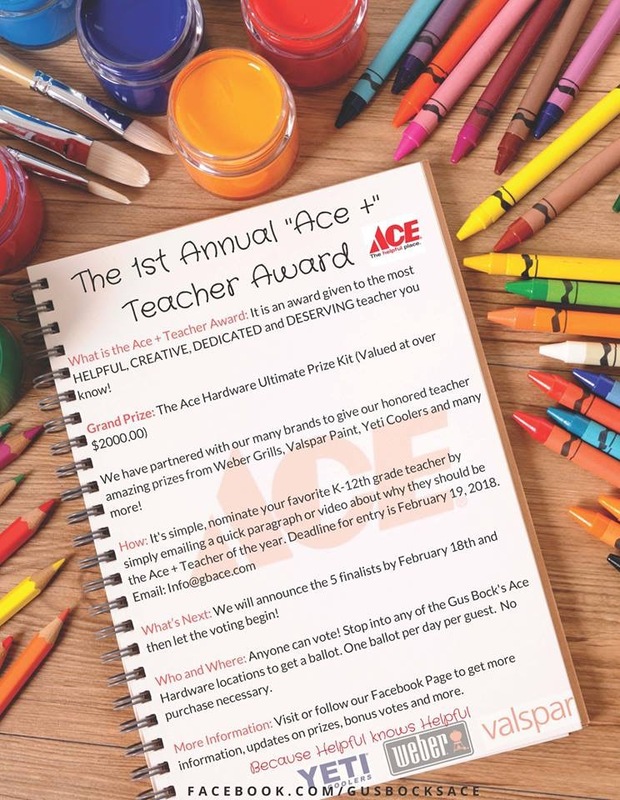 Ace Hardware is holding an award for teachers who are the most deserving to be able to win a prize kit. 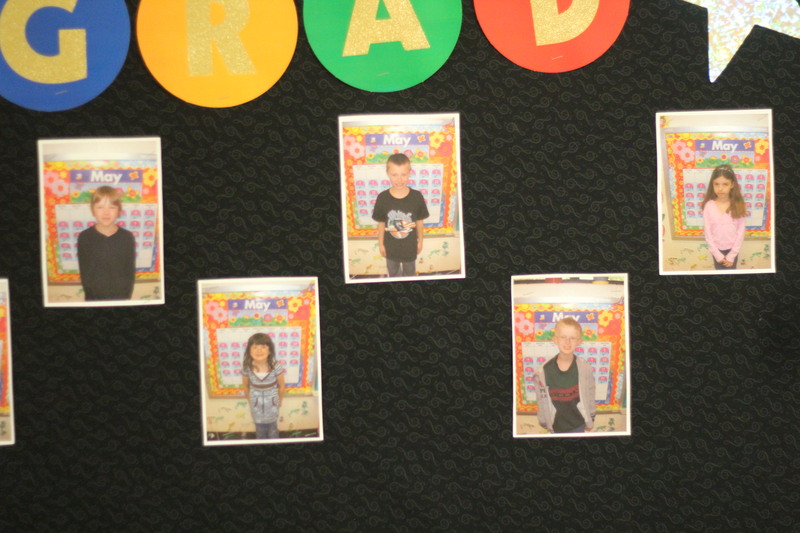 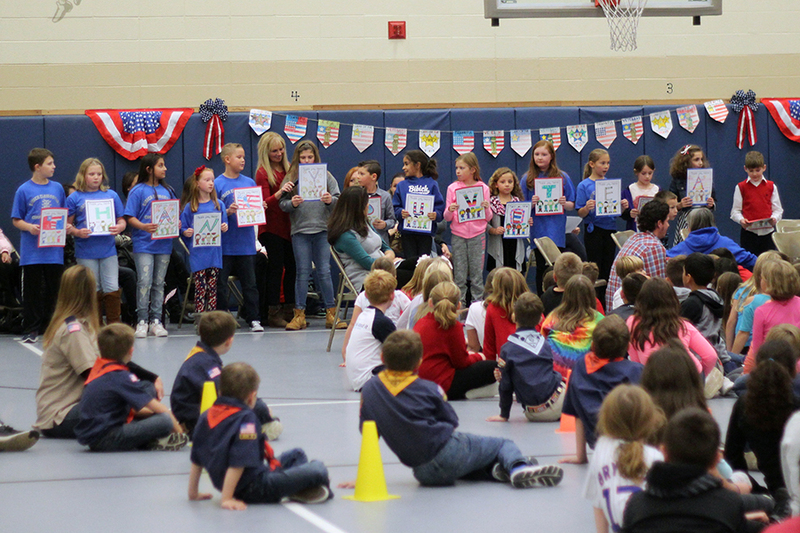 Students are able to submit their favorite teacher and soon afterwards, 5 finalist will be announced and all those in the community will be able to vote for their favorite one. 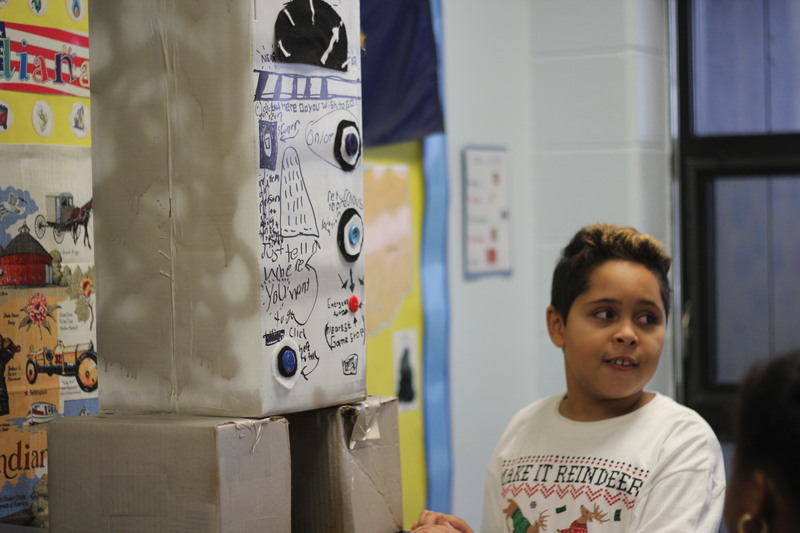 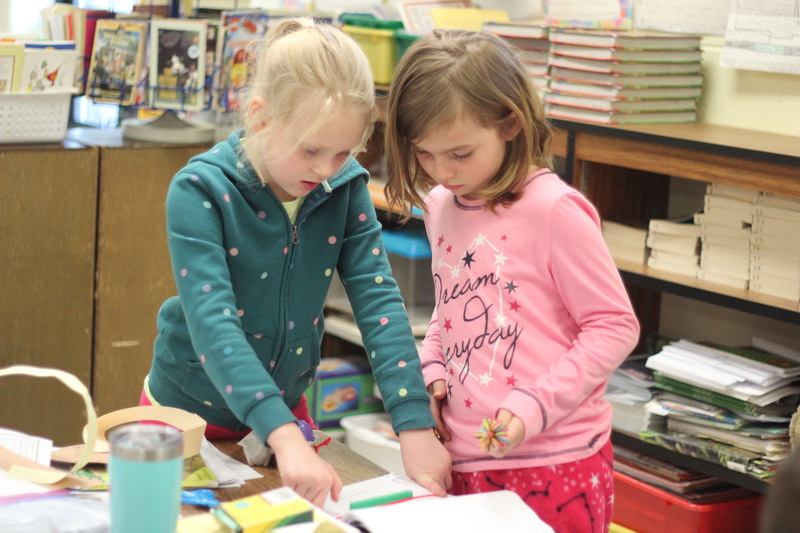 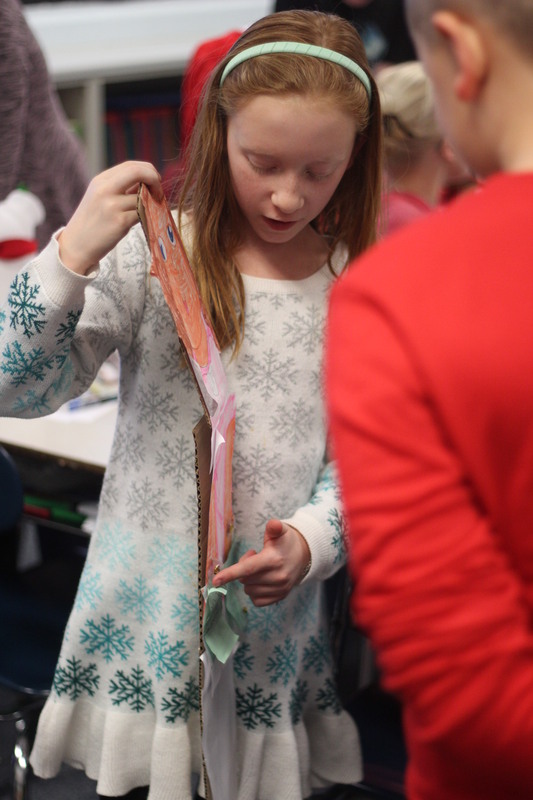 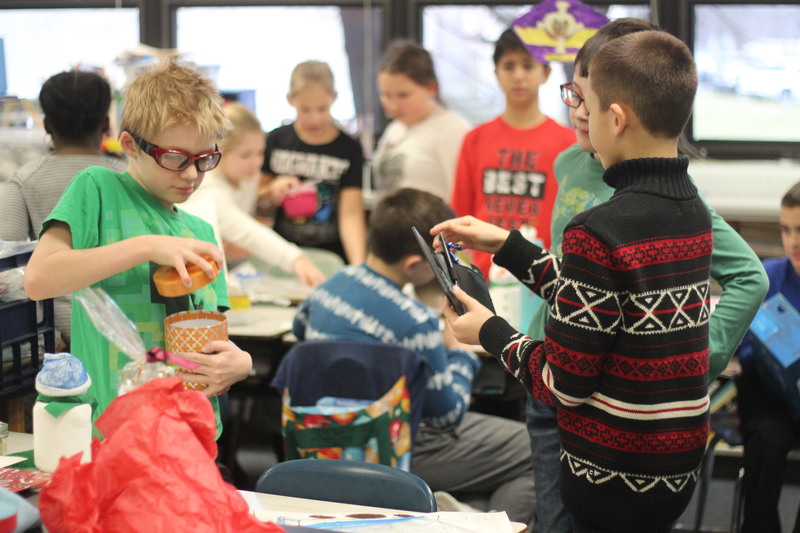 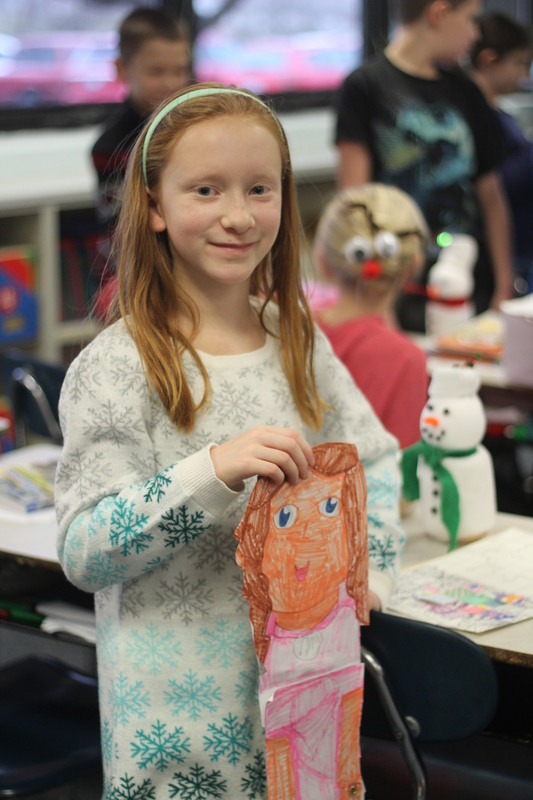 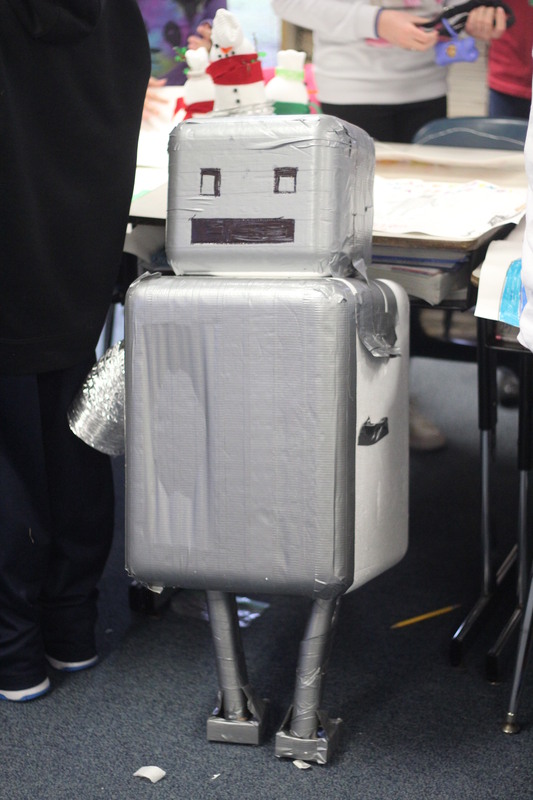 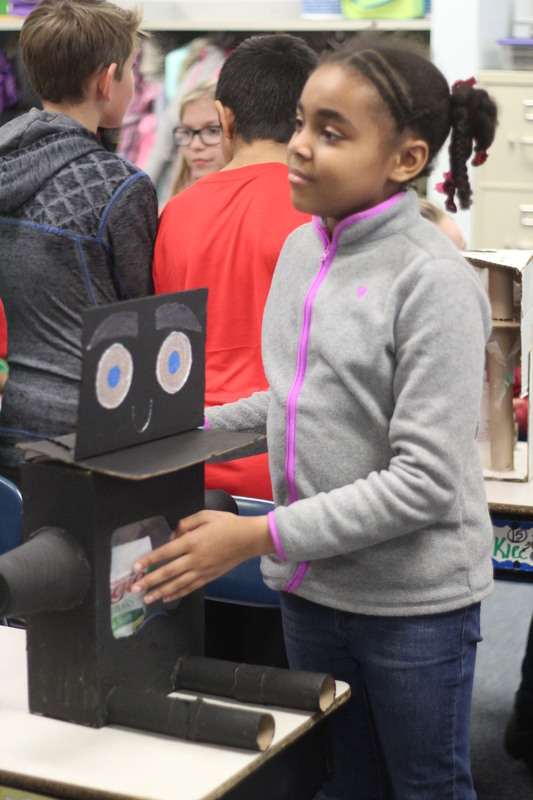 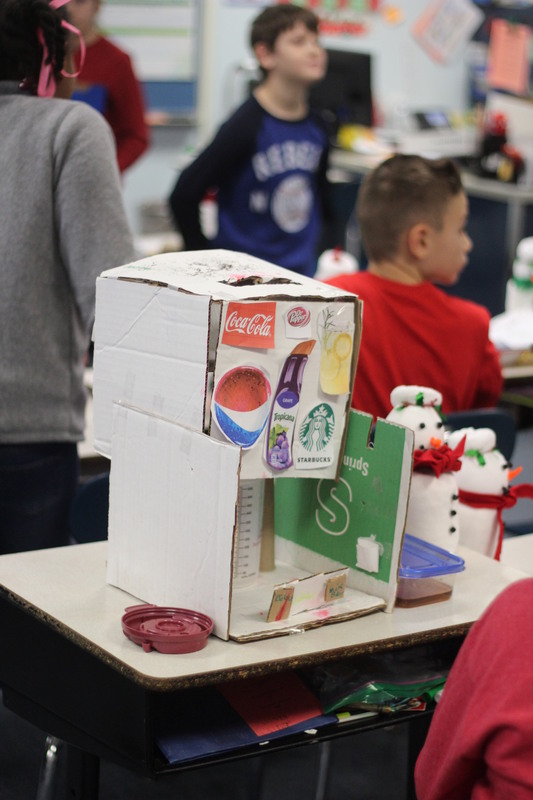 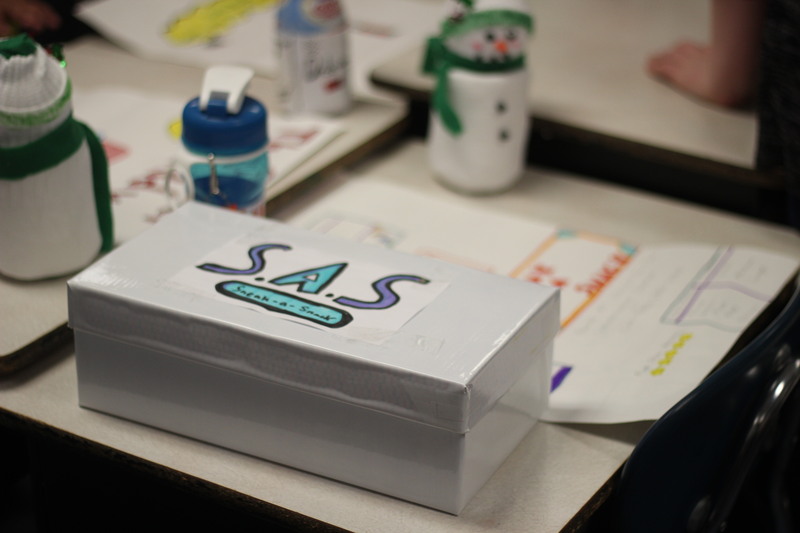 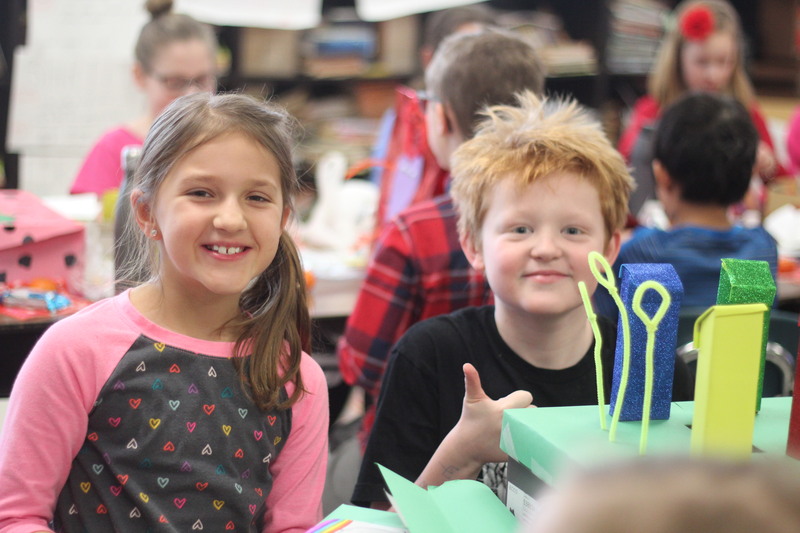 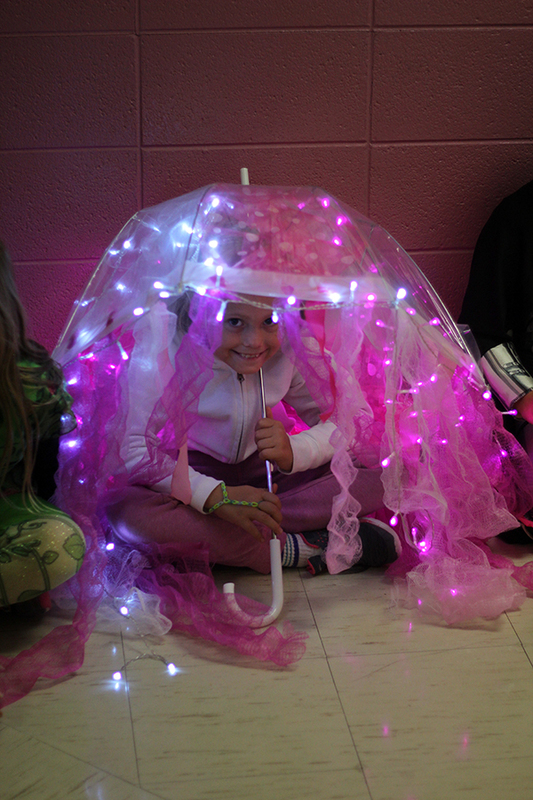 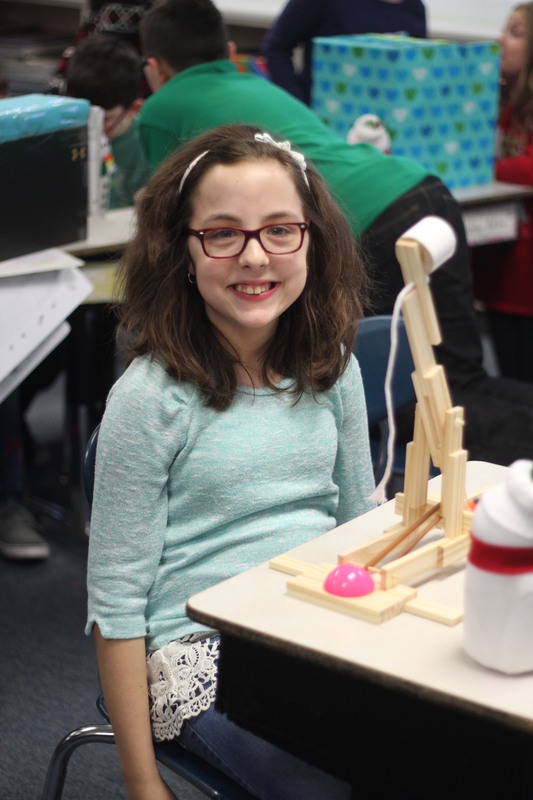 Fourth grade students were able to create projects that were able to help with every day tasks. 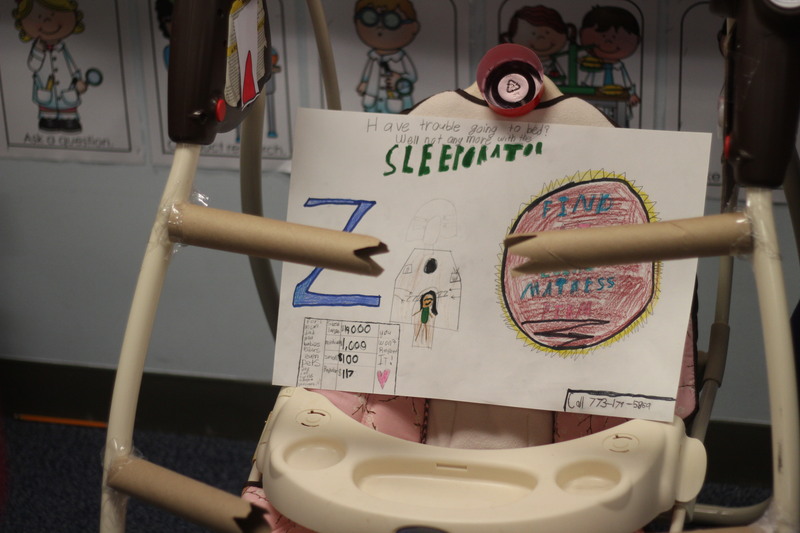 Some ranged from having coffee creamer at the tip of your fingers to a cradle to put a baby right to sleep. 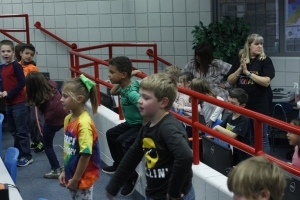 On Jan. 23, Bibich led their first Computer Science Day with Ms. Perez and LC Technology Trainers and staff. 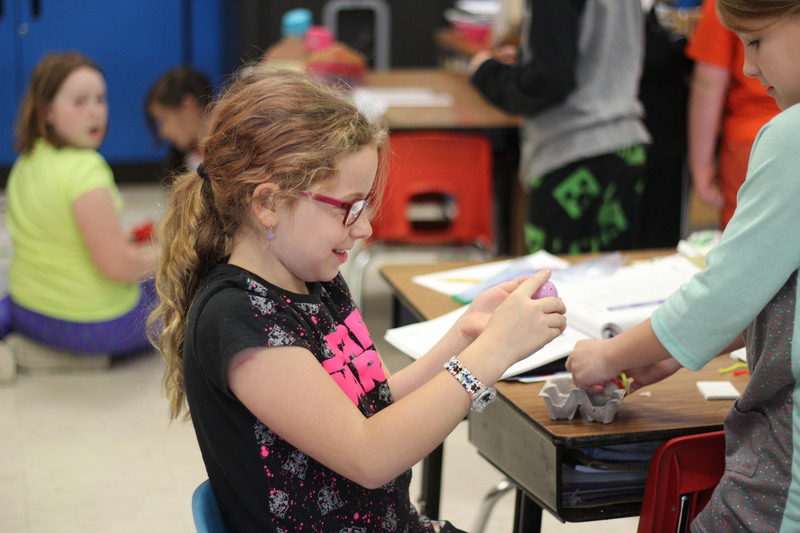 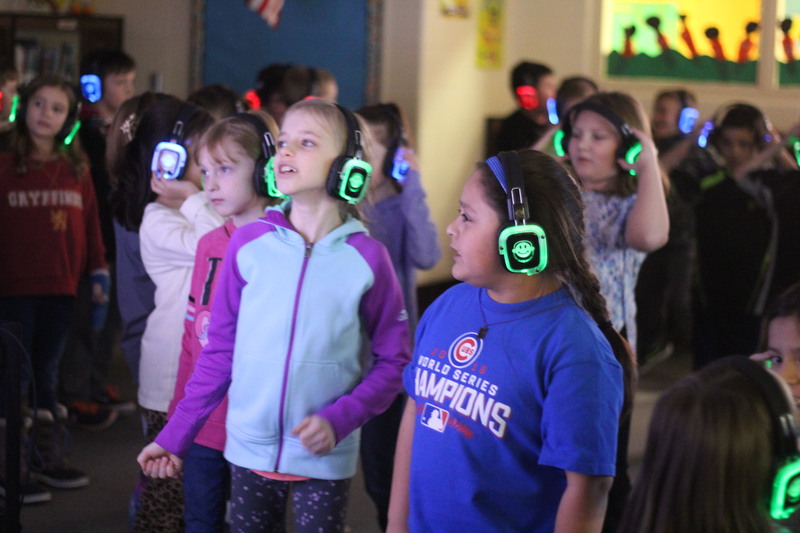 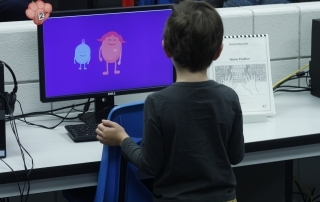 Students were able to work with technology, including headphones and caterpillars and were also able to make coding bracelets. 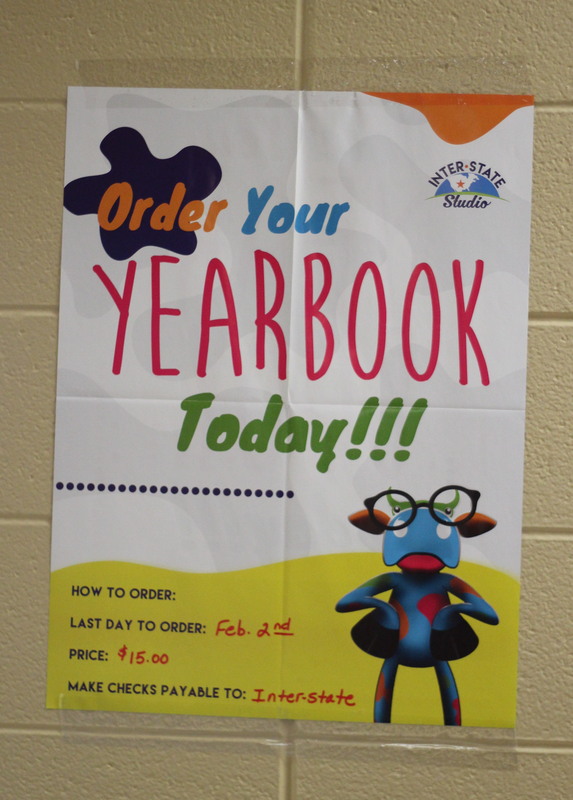 From Jan. 29 through Feb. 2, Bibich will be selling their yearbooks for the 2017-2018 school year. 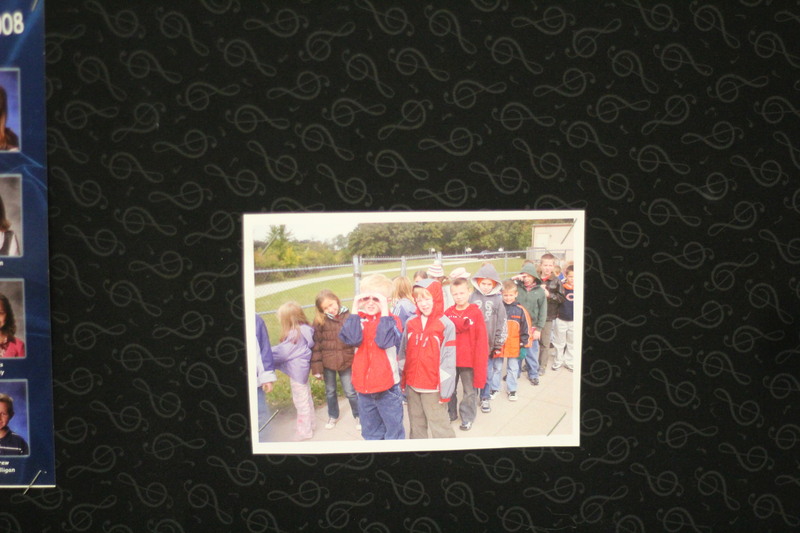 The price for each yearbook will be $15. 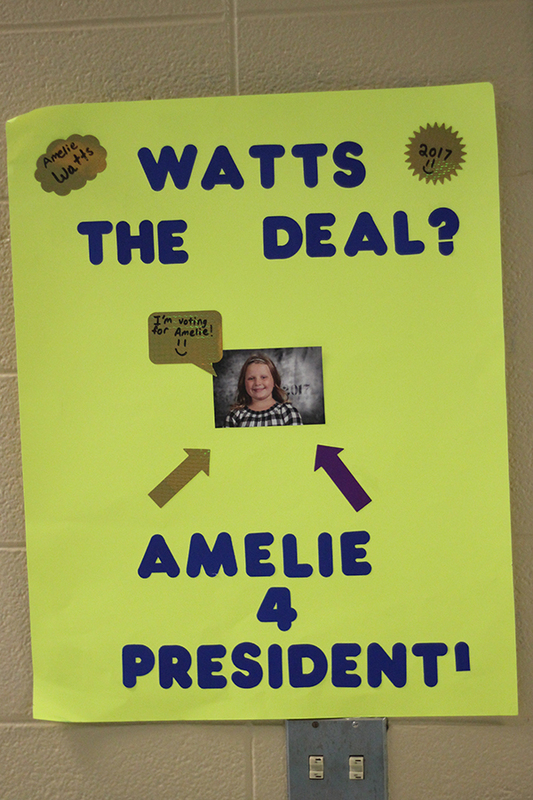 Make sure to pick yours up today! 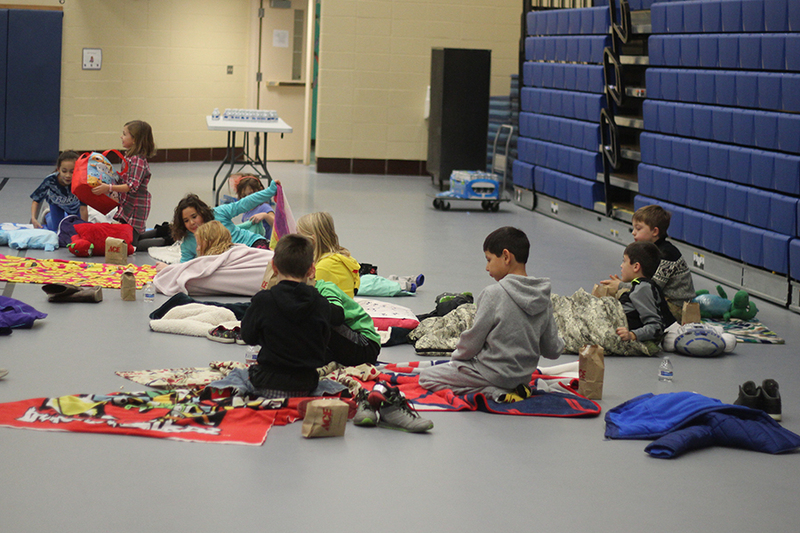 Bibich held their annual movie night for the students on Dec 1. 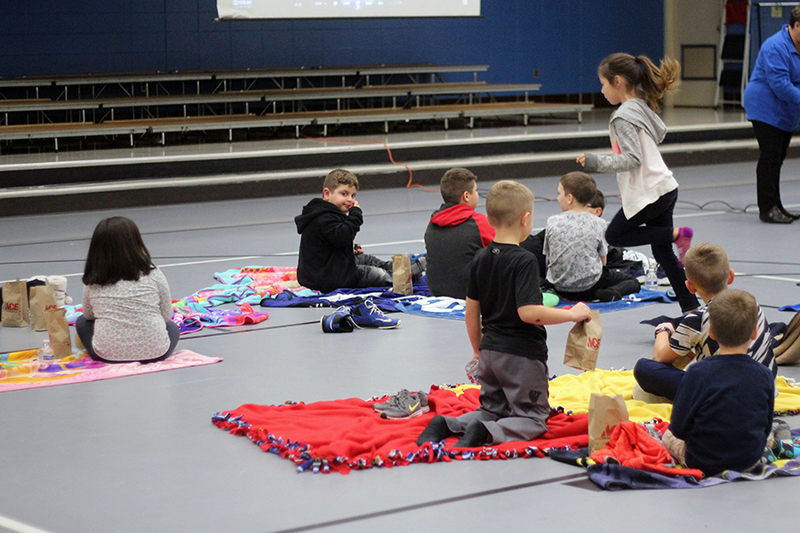 Over 50 students showed up and watched the movie “Pete’s Dragon.” The students were able to eat popcorn and enjoy the movie with their friends. 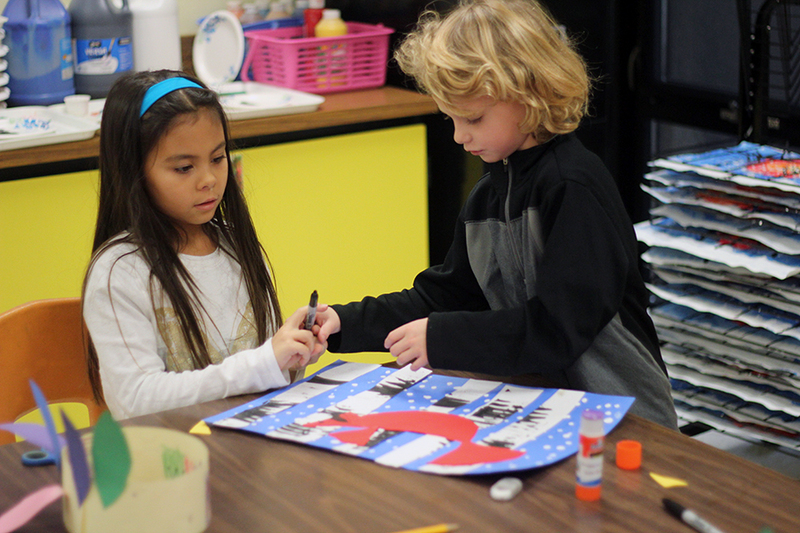 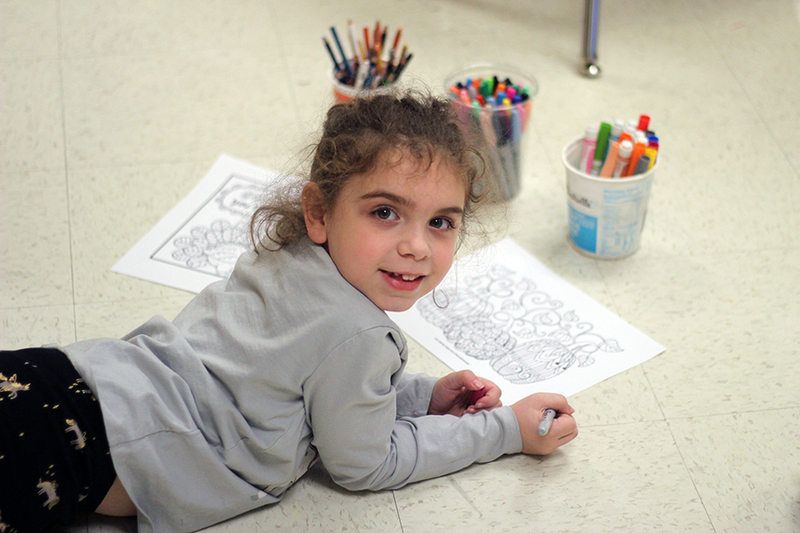 For the first grade classes at Bibich, the students learned about foreground, middle ground and background in art class. 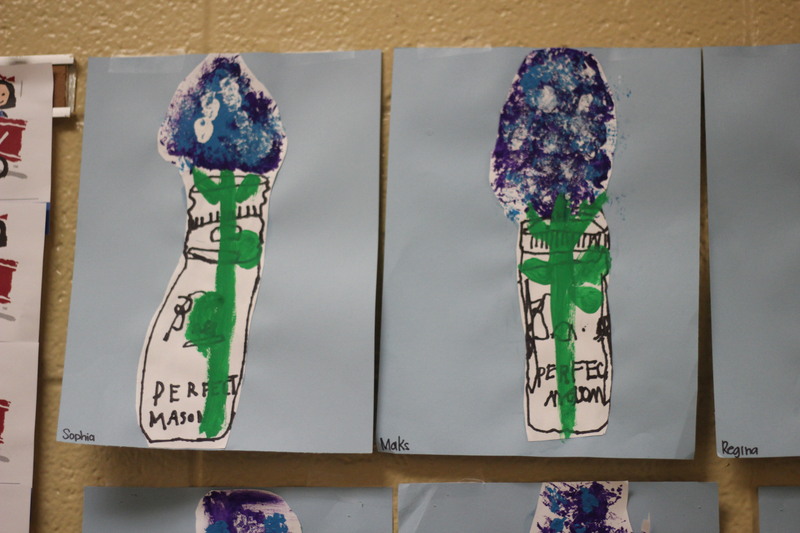 They painted the background with snow, the middle ground with birch trees and the foreground with a cardinal bird. 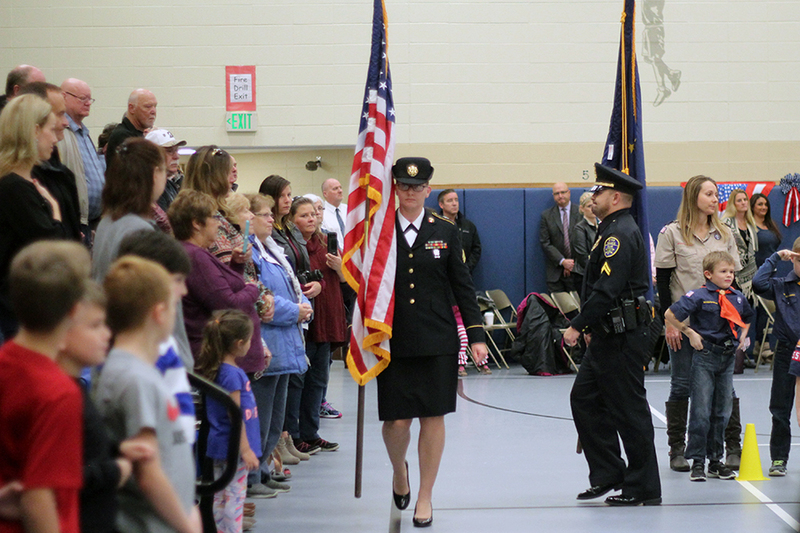 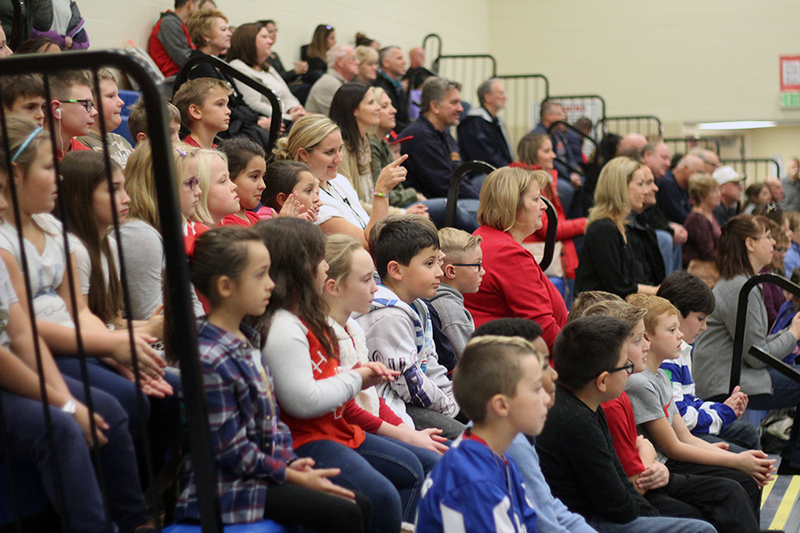 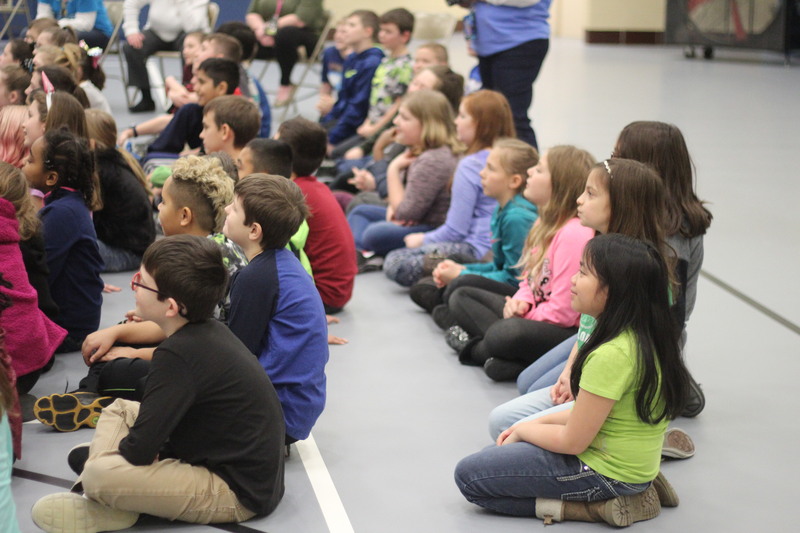 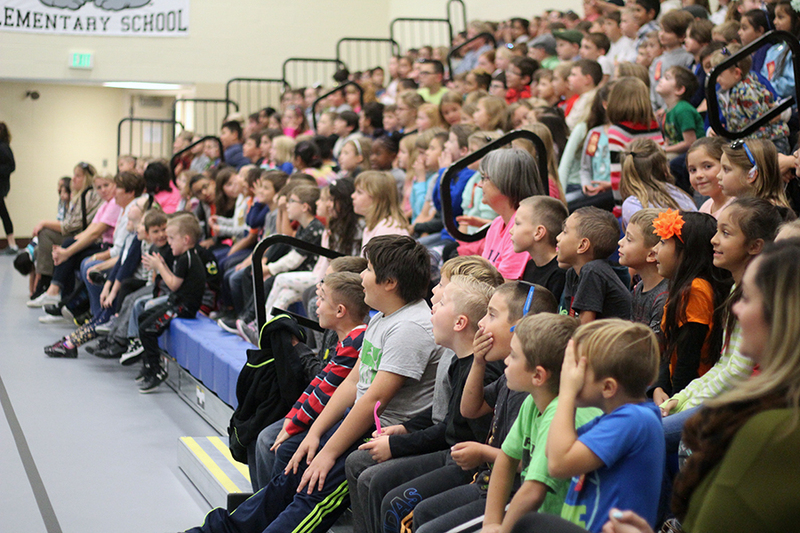 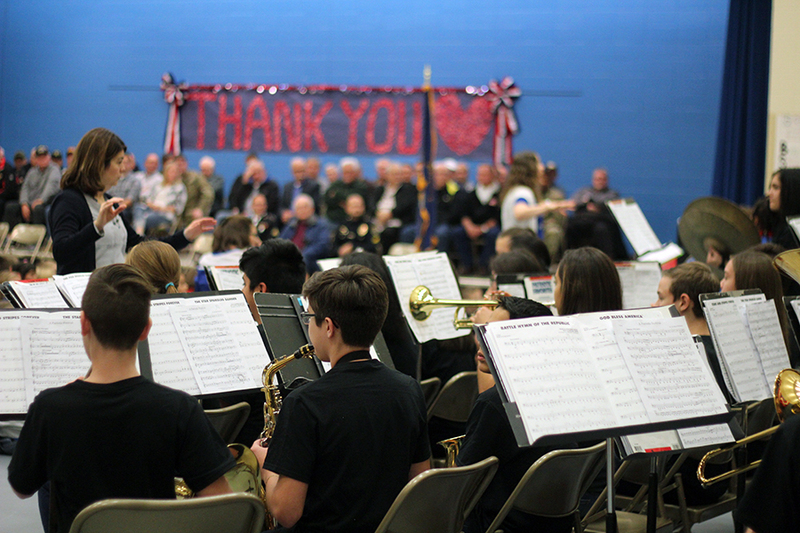 On Nov. 10, Bibich held their annual Veterans Day assembly. 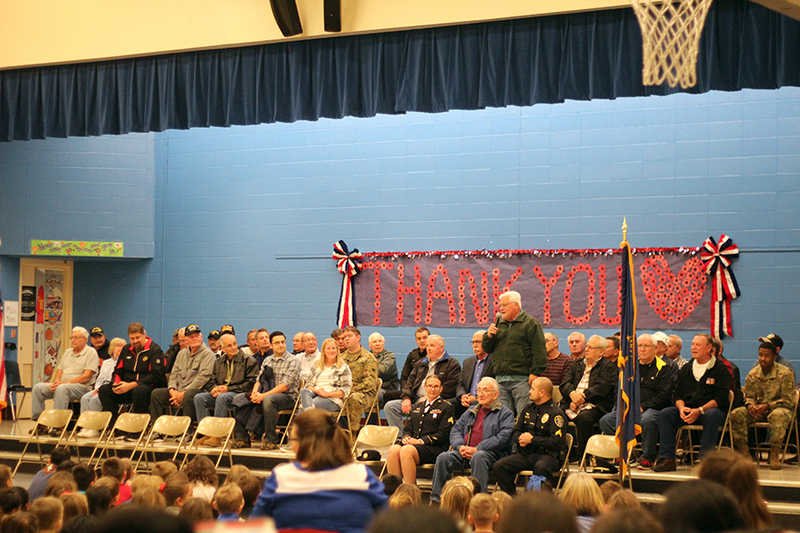 Over 30 veterans showed up to the program and the whole school sat in attendance. 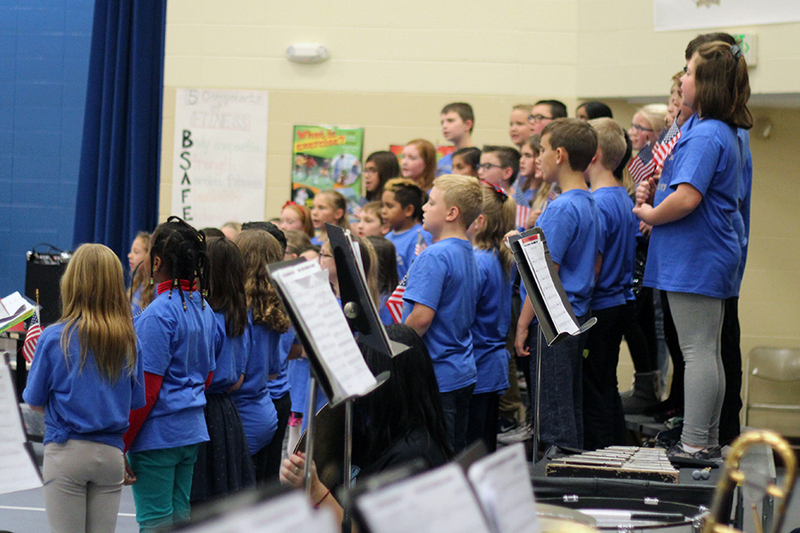 Throughout the assembly, the fourth grade choir sang, students read speeches and the Kahler Band performed. 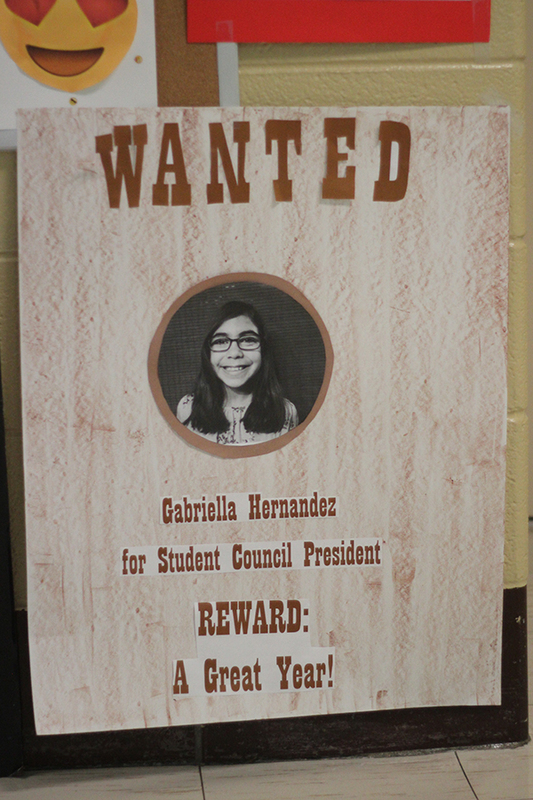 The student council at Bibich will be holding elections for new positions. 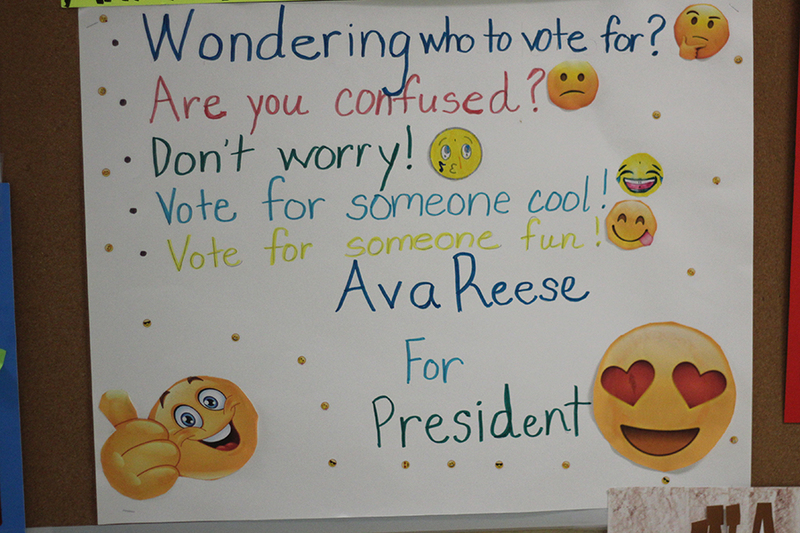 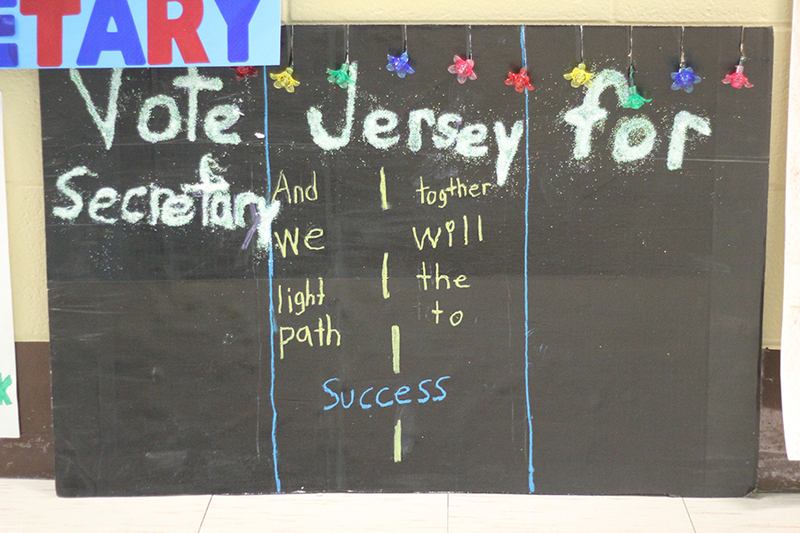 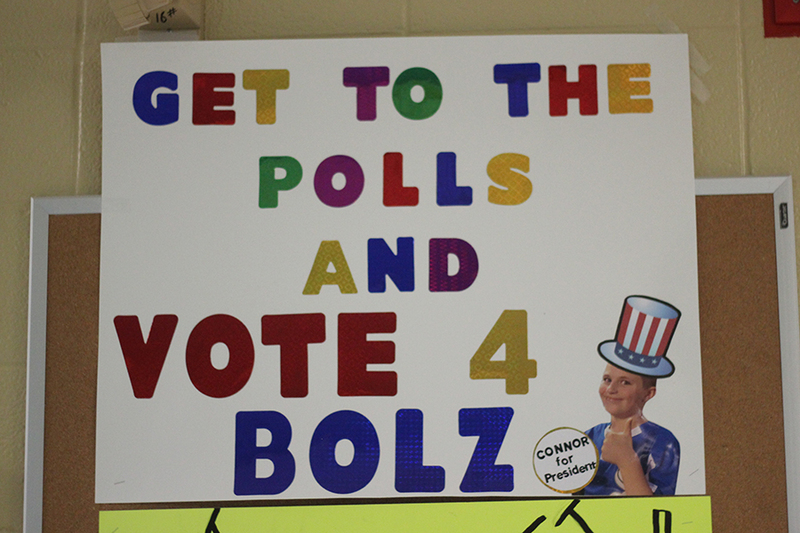 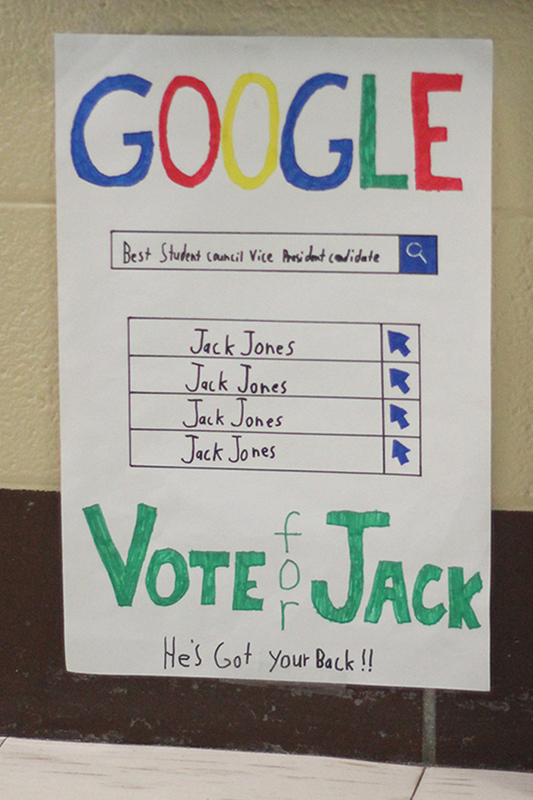 The student council would be able to vote on who will fill each position. 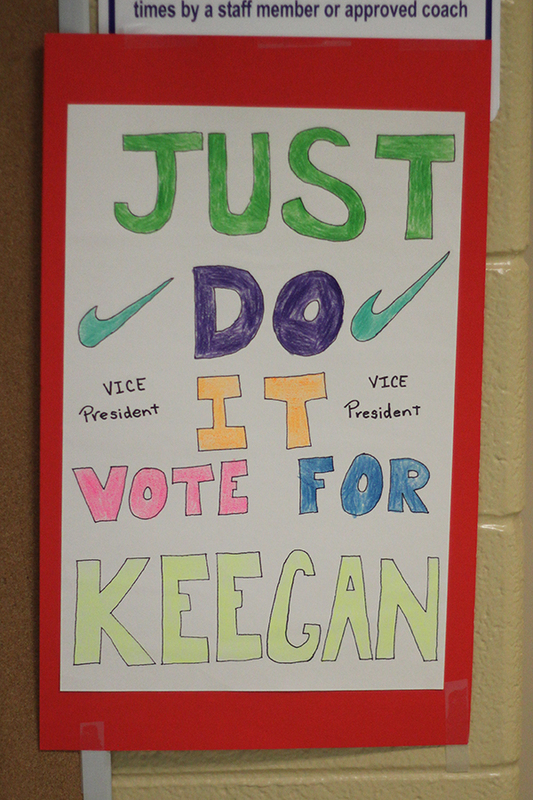 Those running for positions are able to campaign and make posters to promote their self. 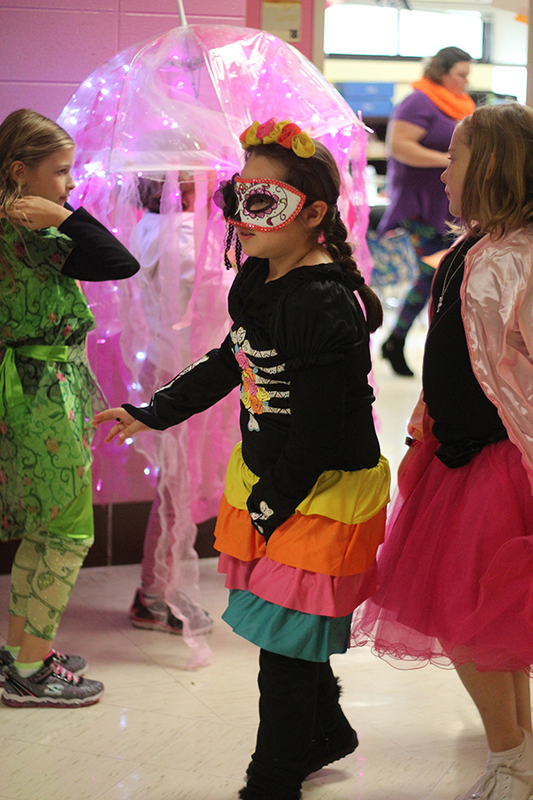 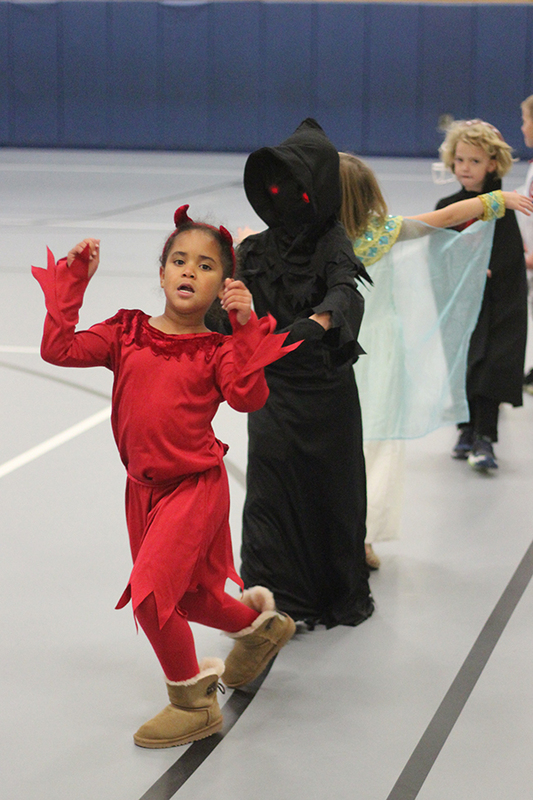 On Tuesday, Oct. 31, Bibich had a Halloween parade around the school. 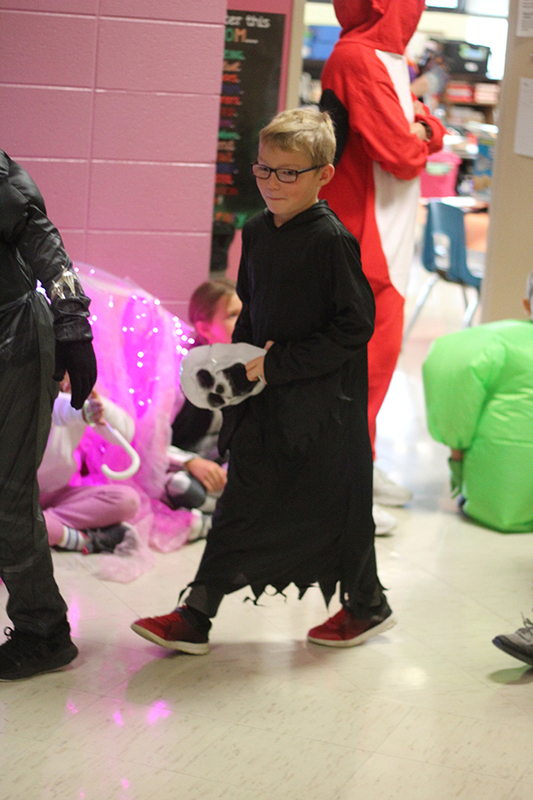 The students were able to wear their costumes and show them off as they marched around the school. 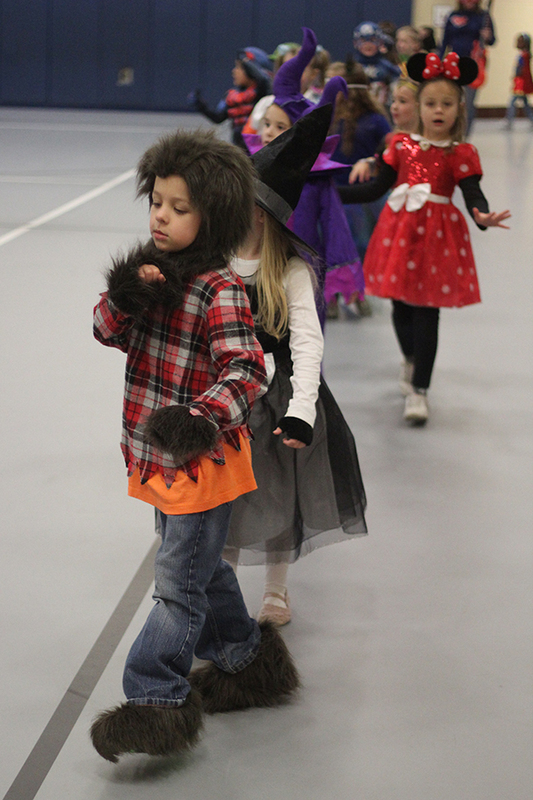 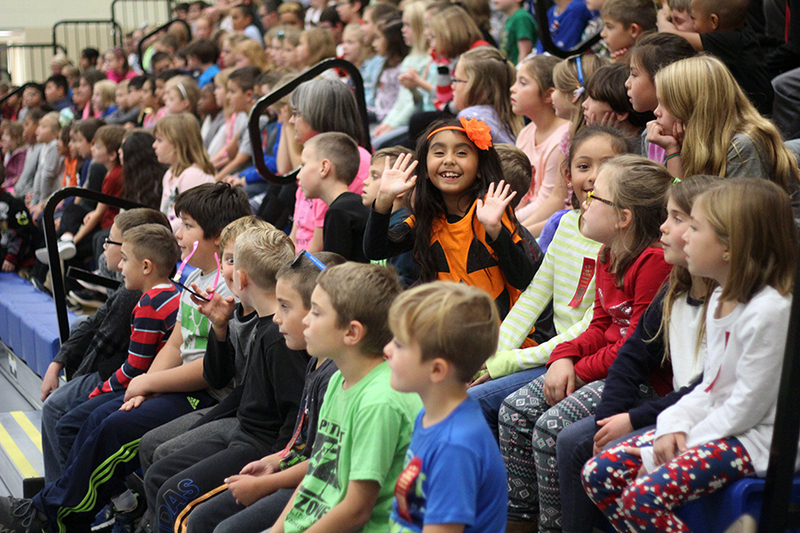 The students then marched through the gym and were able to see all the other student’s and teacher’s costumes.Also, Bibich had their annual Halloween classroom parties. 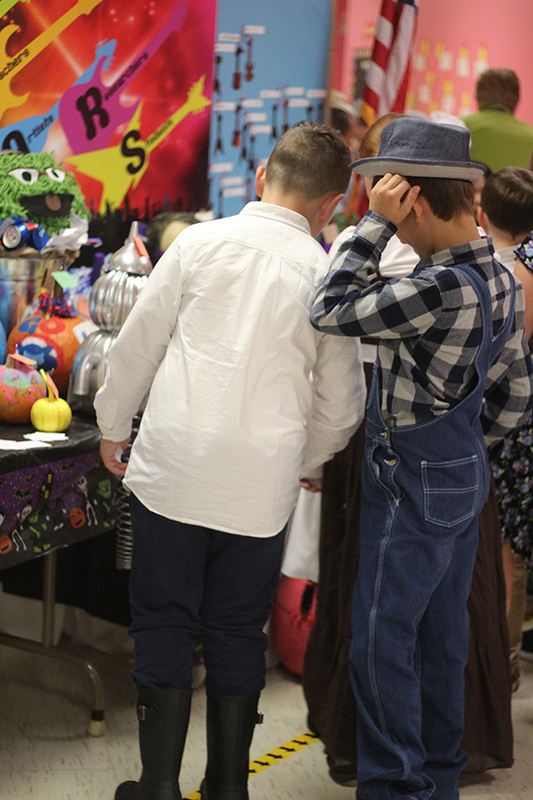 Parents volunteered and helped organize the parties and set them up. 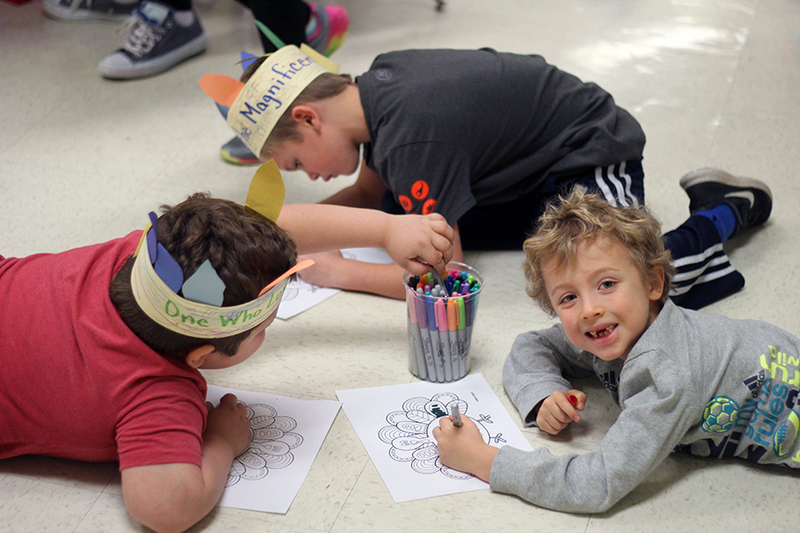 Some parties included different games like bingo, wrapping toilet paper around students, and pictionary, crafts, and lots of snacks. 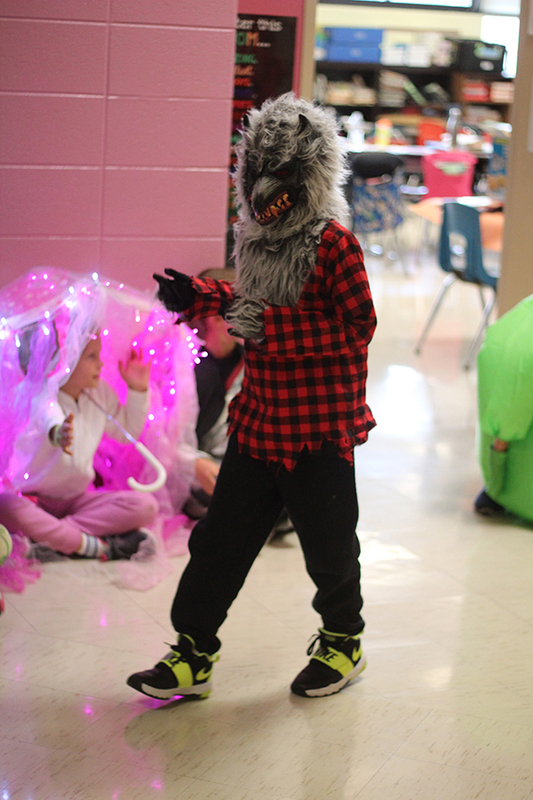 The students were able to dress up in their costumes to celebrate Halloween. 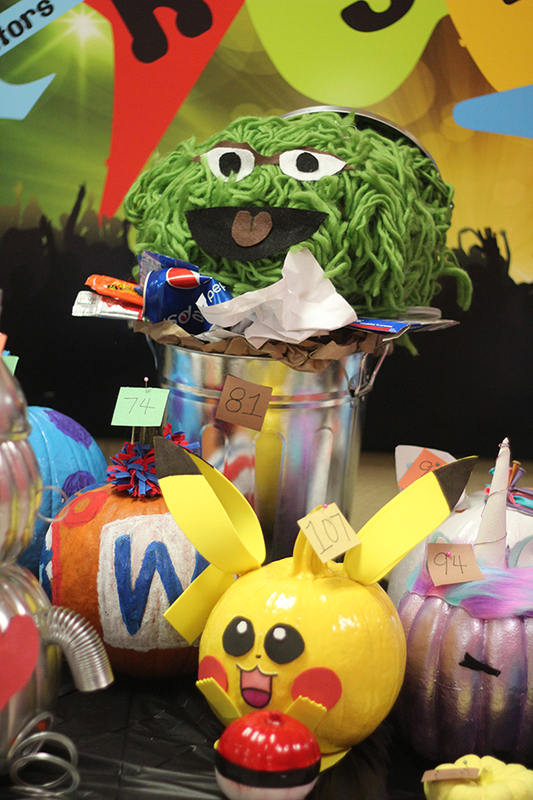 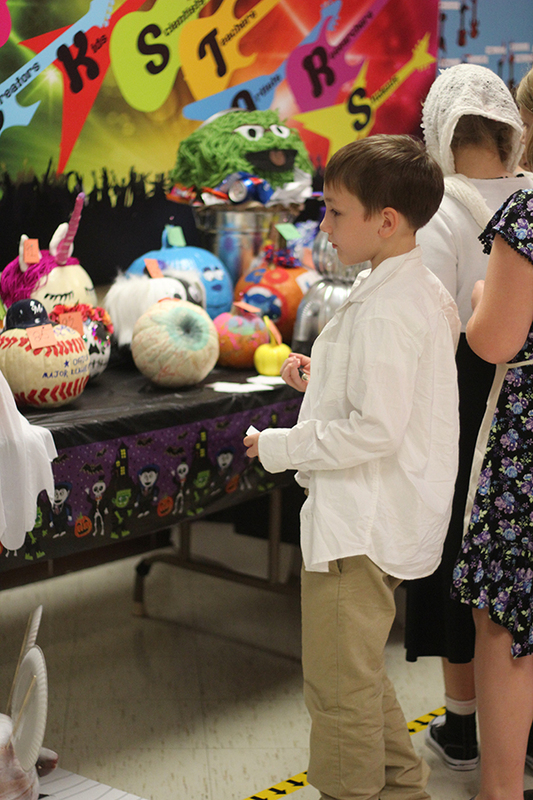 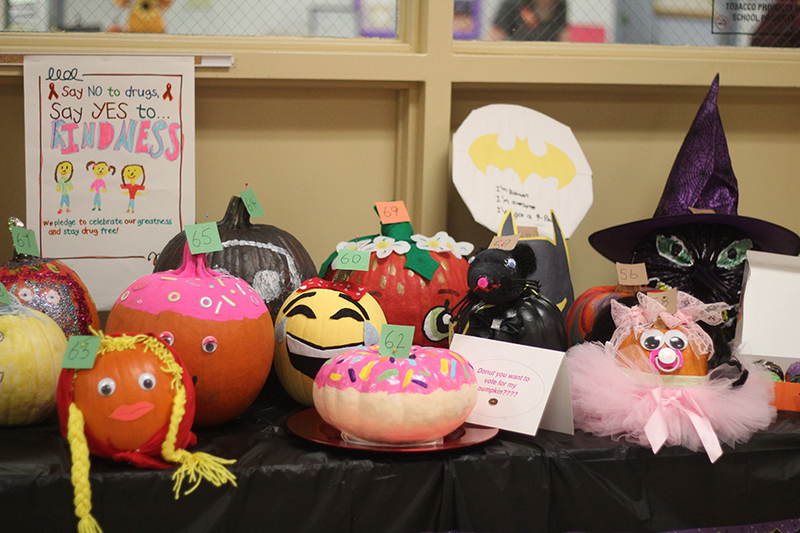 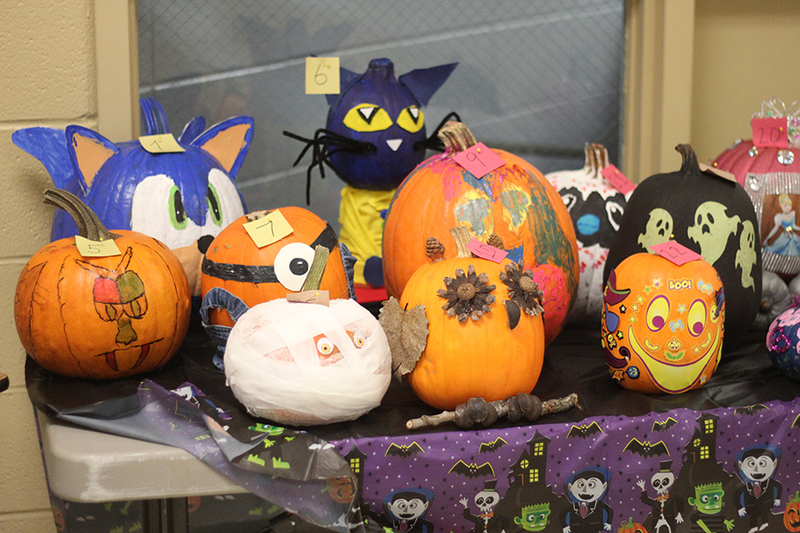 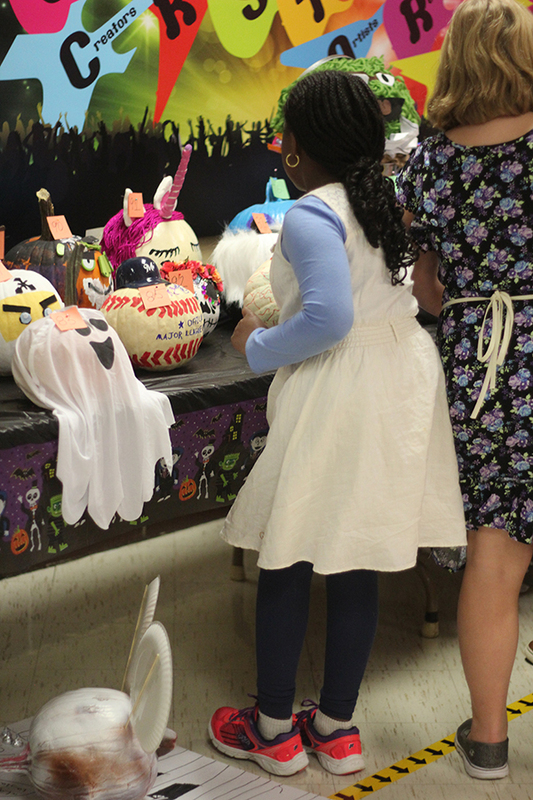 The students at Bibich were able to decorate pumpkins and place them in a contest. 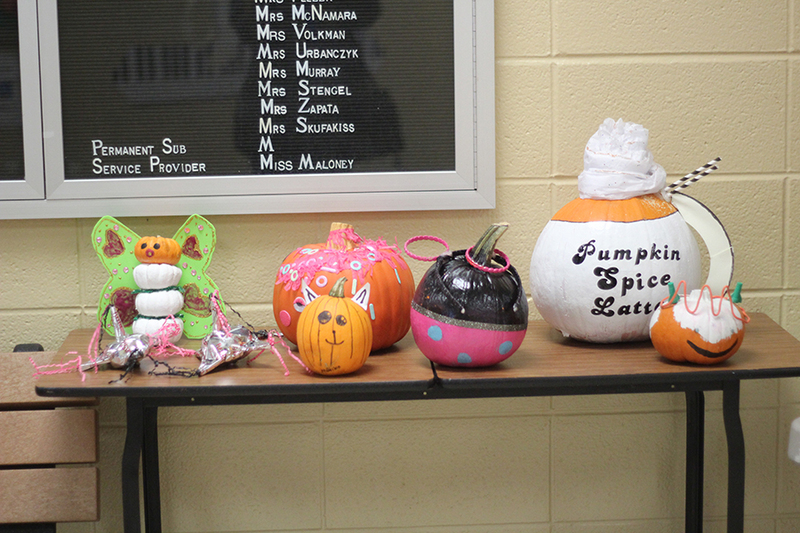 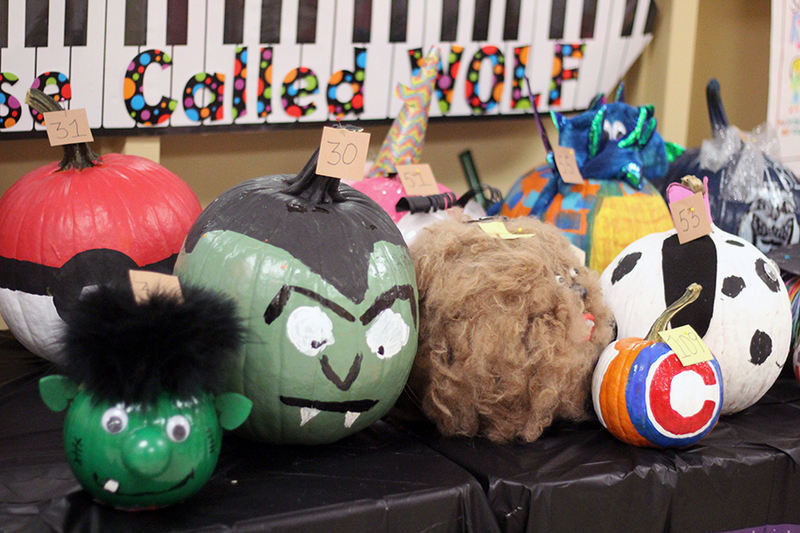 The students were able to vote for the best pumpkin from their grade level so there was a winner from each grade. 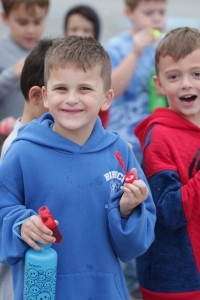 During the week of Oct. 23-31, Bibich had the Red Ribbon Week. 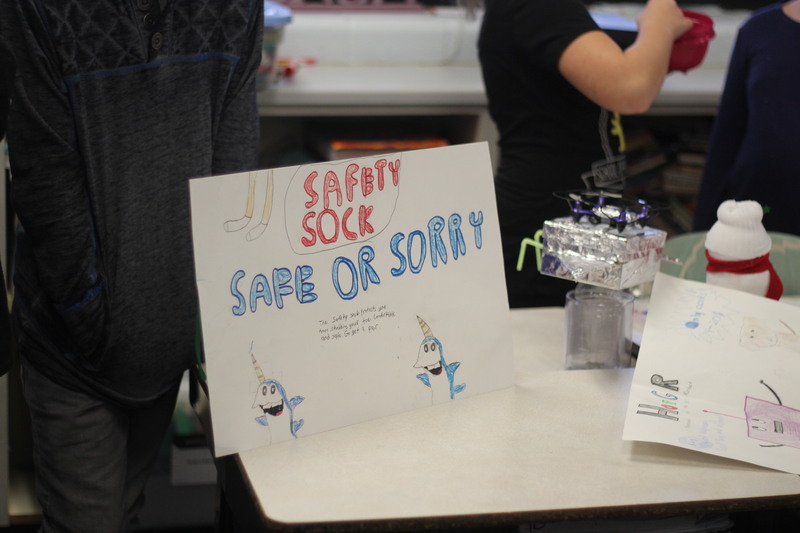 During that week, the students are educated on why alcohol and drugs are harmful and why they should steer away from them. 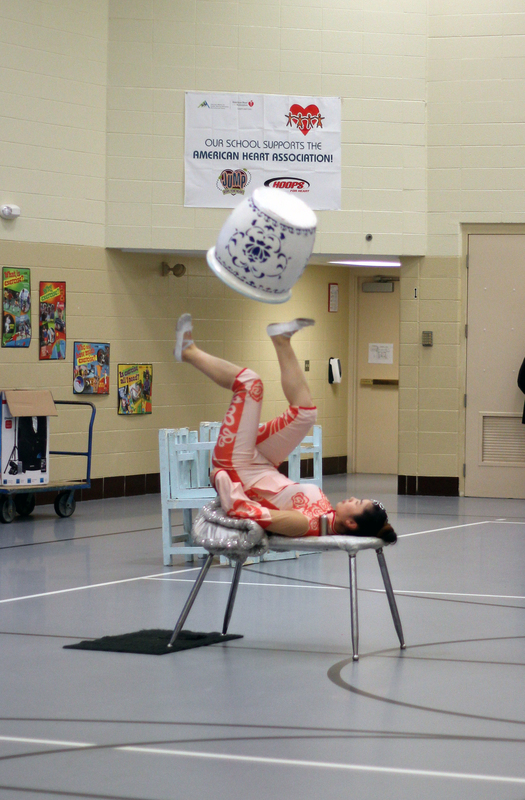 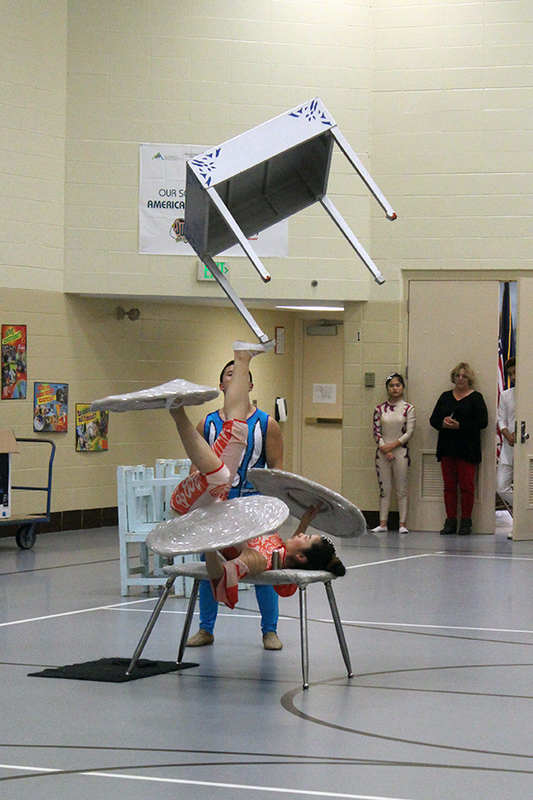 One of the activities during the week was Chinese acrobats. 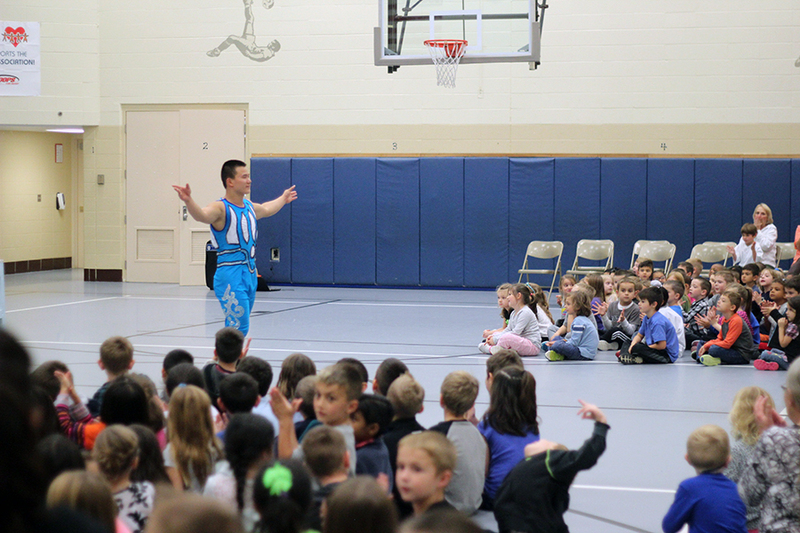 The acrobats performed one of their shows for the entire school and the lesson was the acrobats wouldn’t be able to perform as well as they did if they were on drugs.